First posting for my 2015 Mass Build contribution. I am actually planning on building 2 models for this years mass build, I am going to have a crack at the Jocasta as well when this gets completed. So in between finishing off the Weller Concept, planking up the Chippie, I am about to confirm my membership of club insanity and start a 3rd parallel build.. So this is my number one choice of model for this years build. I am going to build it more or less exactly as per plan (the Mk 2 version) but I am still undecided on the choice of power plant. I have an OS 26 FS that would be perfect for this but I may choose do an electric powered model. The reason why I am undecided is that I would like to use this model as a platform for a UAV sometime in the mid future (not before MB time I hasten to add). There is enough space for me to put a small onboard computer - probably a Raspberry Pi - and I would like to be able to get a model to take off, fly a circuit and land - unassisted. Before the Safety conscious start screaming, it will have R/C backup - so that I can safely switch between programmed and uncontrolled (by me) flight in case things go pear shaped.. However, that part of the dream will be subject to a different thread if there is sufficient interest - and the model survives that long.. 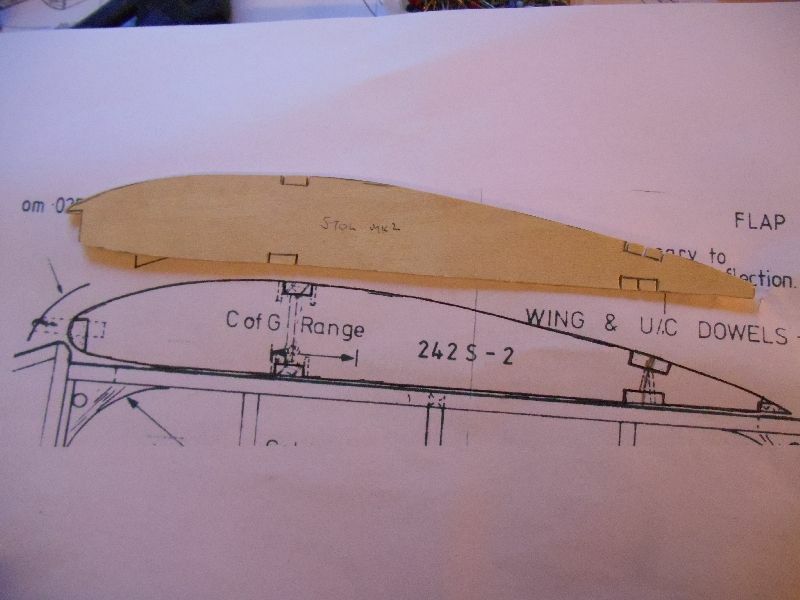 So - this morning activities will be to photocopy the plan for the wing section and formers and start cutting..
On my watch list Martyn. The STOL promises to be a very interesting mass build. I am planning to use an OS FS30 in mine and wonder if you think this might be too much? I do have a 26 I could use. The plane will be light but I am hoping that it will be able to cope with quite a payload. Peter Russell always said that this was never intended to be a beginners model - after examining the plan I can see that the reason for this is that there is scope for adaption, there isn't a lot of build information beyond the basic outlines. However, it is a very tradition build (except for the slots), I am going to do a beginners style blog in case anyone wants a crack at this as a first build. So - unusually for me, I am starting o the wing. 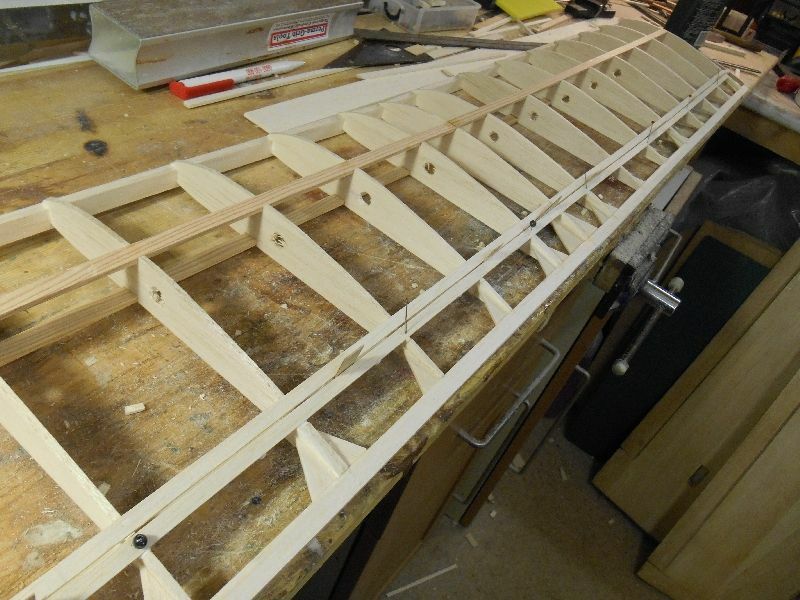 This is a parallel chord wing with not that many wing ribs. At the risk of upsetting our hosts, I don't think a partial kit is really needed here so I am scratch building.. The wing ribs. I have made one minor change to the wing. 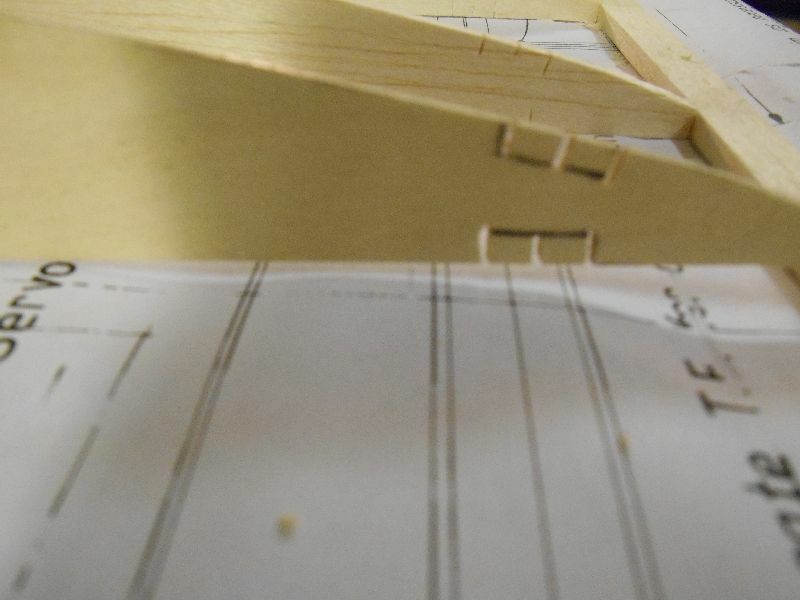 The plan shows a very hard trailing edge from 1/8 sheet balsa with the wing rib overlapping on the upper surface. 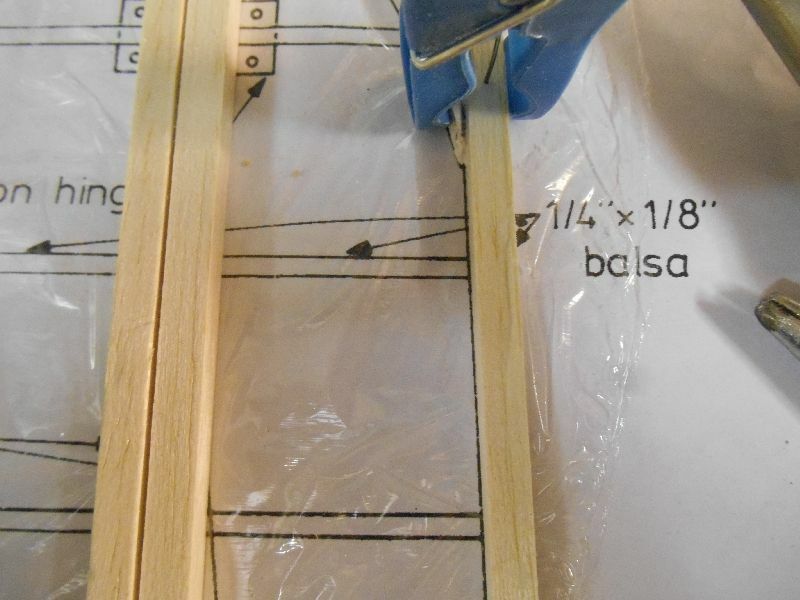 I couldn't find anything suitable - and didn't want to use spruce so I have removed the overlap and elected to use 3/16" medium density balsa as an alternative. Cut a template from 1/16" ply. 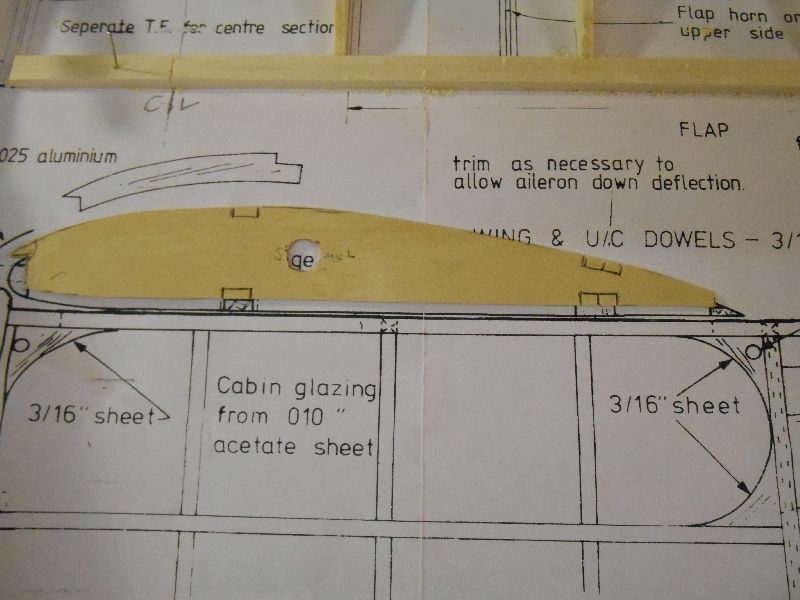 The wing section needs to be transferred - I scanned the plan and then carefully drew around the scan onto the ply with carbon paper used to transfer the image. Cut to waste - and then sand back down to the correct size. 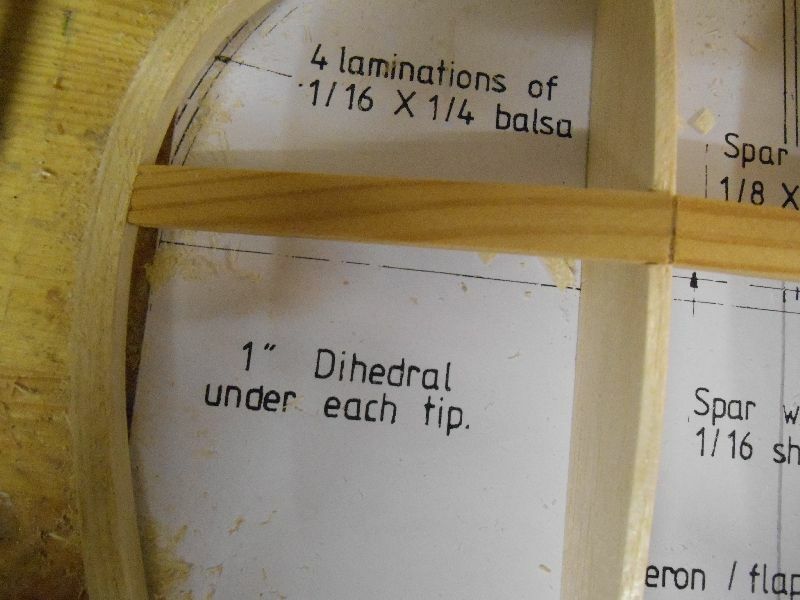 The spar slots are marked and then cut with a razor saw - you only need the depth - I'll remove the wood later. I cant photograph this and do it at the same time, but basically, I cut a piece of sheet the length of the rib - you will get 3 ribs from the width of a 4" sheet, place the fingers on the rib pushing down onto the sheet underneath and cut around the template. The trick is not to move the template and wood as you will introduce errors. Use a new scalpel blade - it makes life much easier. 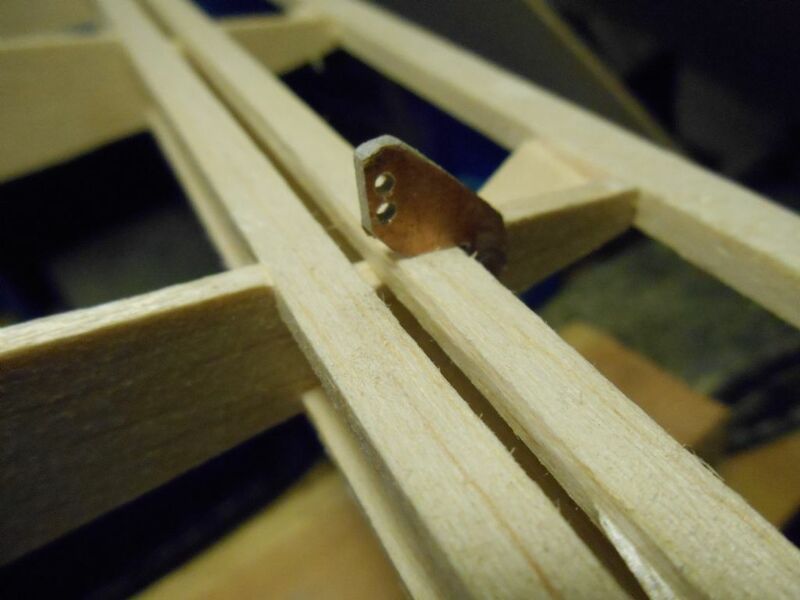 The spar slots edges are simply cut but the waste wood isn't removed yet. I do that when I am ready to fit the spars. Not shown here, but a hole is required for the aileron push rods or servo leads. 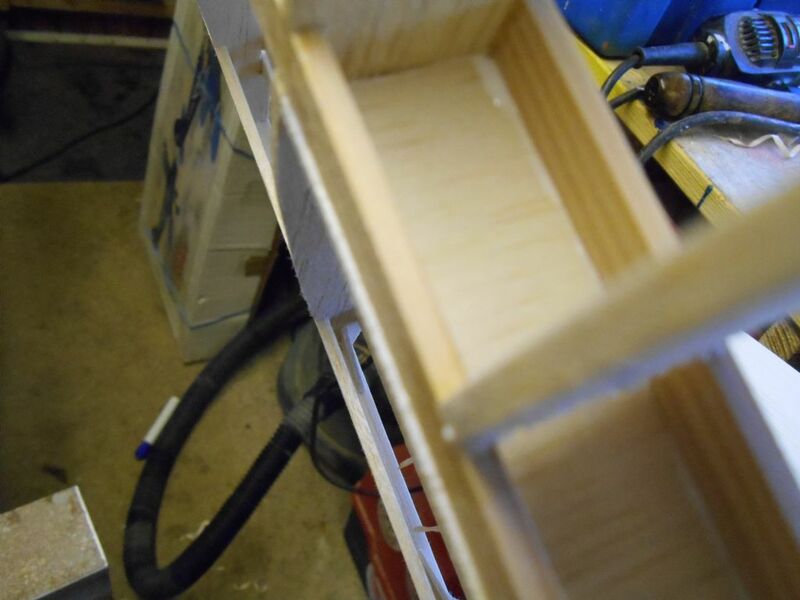 10 ribs need the hole, these were stacked and using the template at the top and a block of wood at the bottom, drilled through using progressively larger drill bits until I had a 'fairly' neat round hole.. 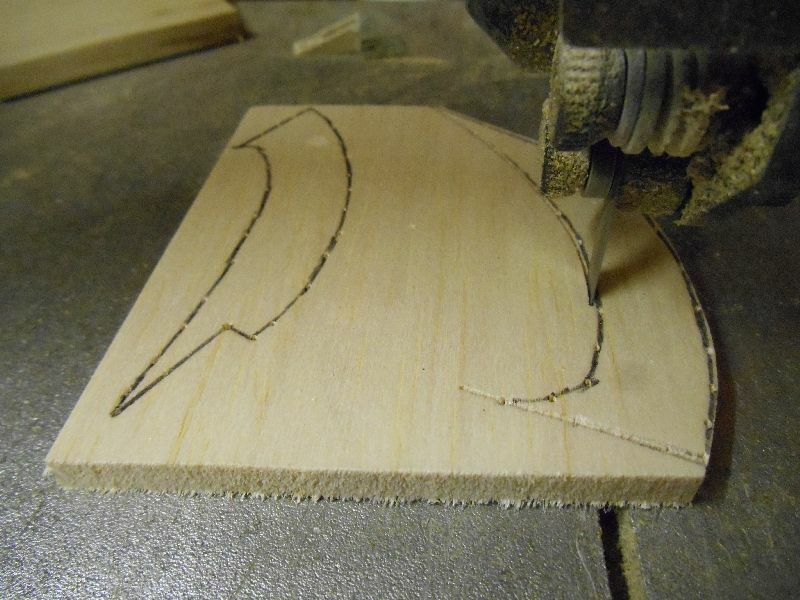 The riblet template (1/16" ply) is cut from the main template. 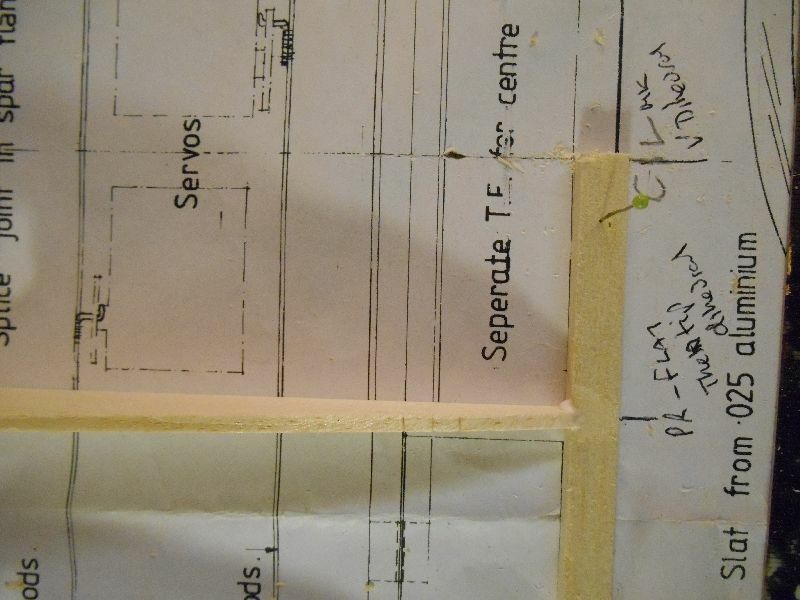 The plan shows the riblets used by PR are about 5mm wide - top surface only. I am going to use full depth riblets, they are stronger but importantly also help with the wing stiffness. It took less than 2 hours to get all the wing ribs and riblets (and some spares) cut. Before I start work assembling the wing, we need a former for the laminated wing tips. 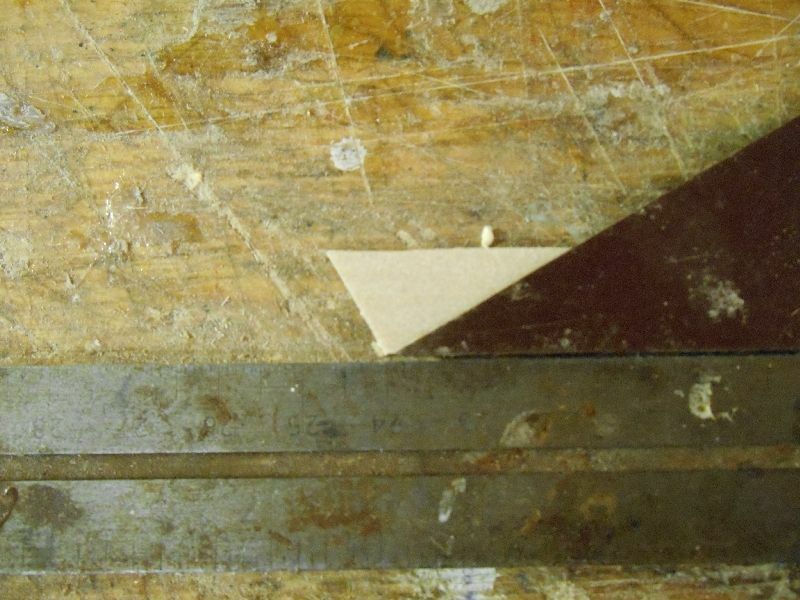 This is cut from a piece of 1/4" x 4" balsa. 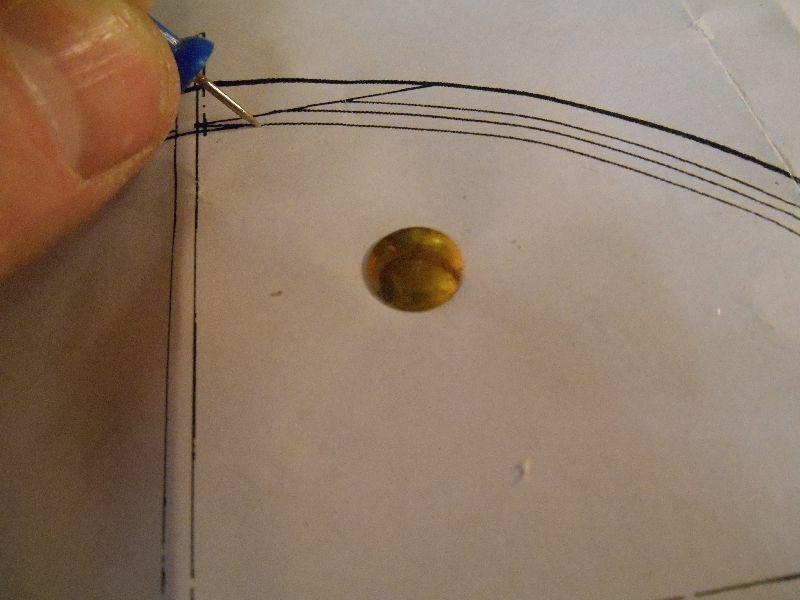 Its just wide enough so you will need to check that it is centred correctly before you start marking out the shape. 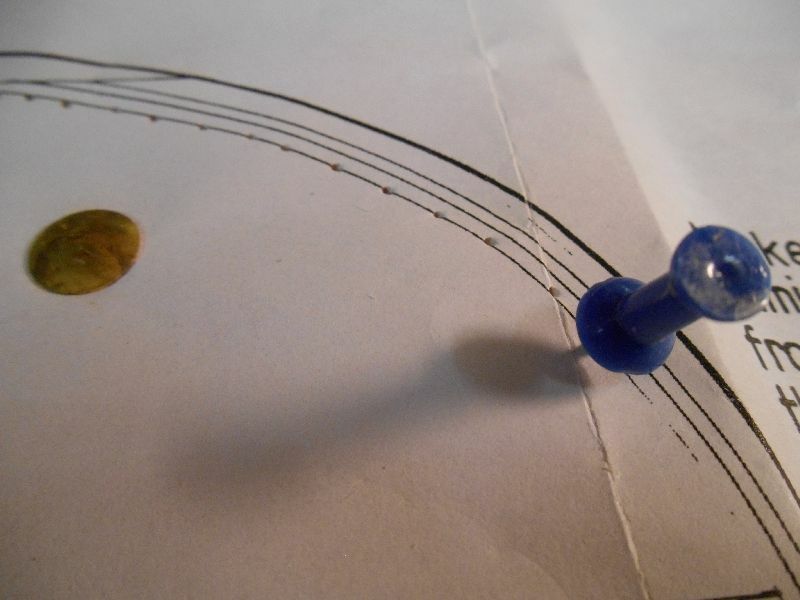 When centred use a couple of drawing pins to stop the wood from moving then using a push pin, pin prick the outline. Join the dots and cut it out.. Fit the LE and TE. 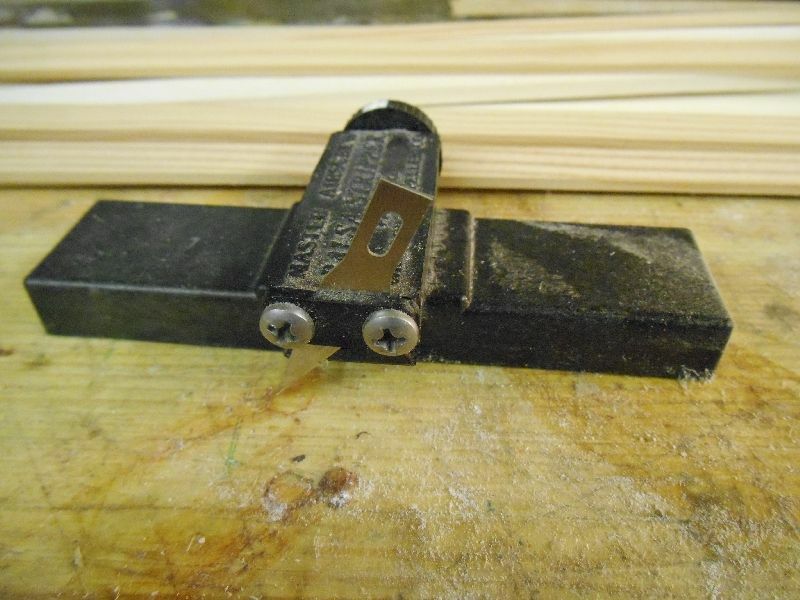 All the spars (except for the spruce spars) have been cut using one of these little balsa strippers. Recommended by BEB, I don't know how I manage without it now. I use a Swann Morton no.11 blade but I set the blade so that it stops cutting about 1/32" above the base. Each strip is then cut, then flipped and the cut is completed from the other side. This gives nice sharp square edges to the wood, improves the longevity of the blade but also does not damage the cutting mat (or plan). The other 'trick' I use is to move the wood when cutting, not the stripper, i.e. 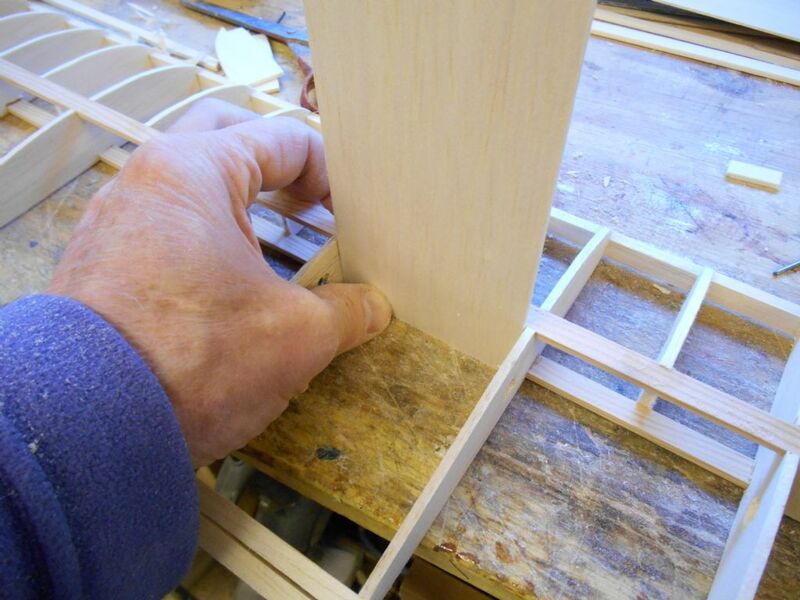 run the wood through the stripper - not the other way around..
With the LE and TE pinned down start fitting the ribs. 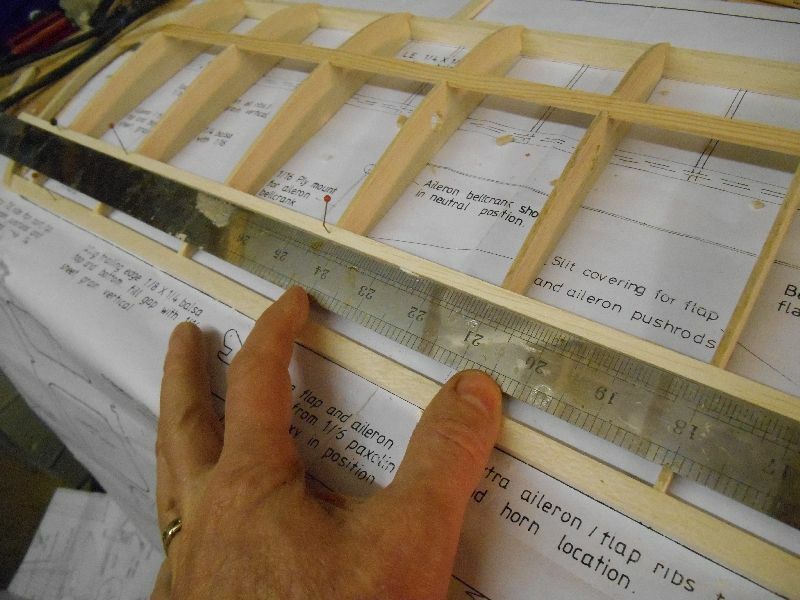 We will cut the flaps and ailerons off later..
Each rib is fitted over the plan, glued (using PVA) and checked that it is vertical.. 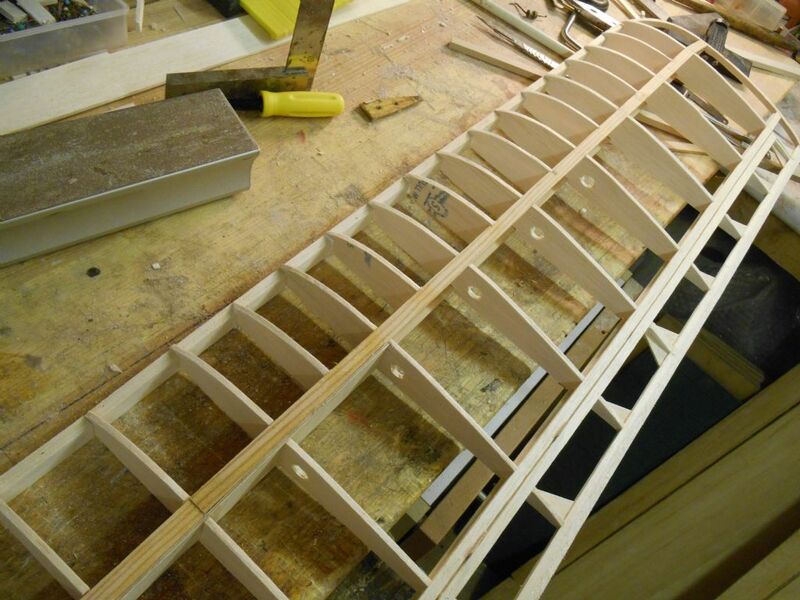 Finally for now the ribs in the right wing half have been fitted. Making the laminated wing tip. Cut 4 off 1/16" x 1/4" x 15" long strips using nice straight grained wood. Needs to be fairly soft density though but not crumbly. 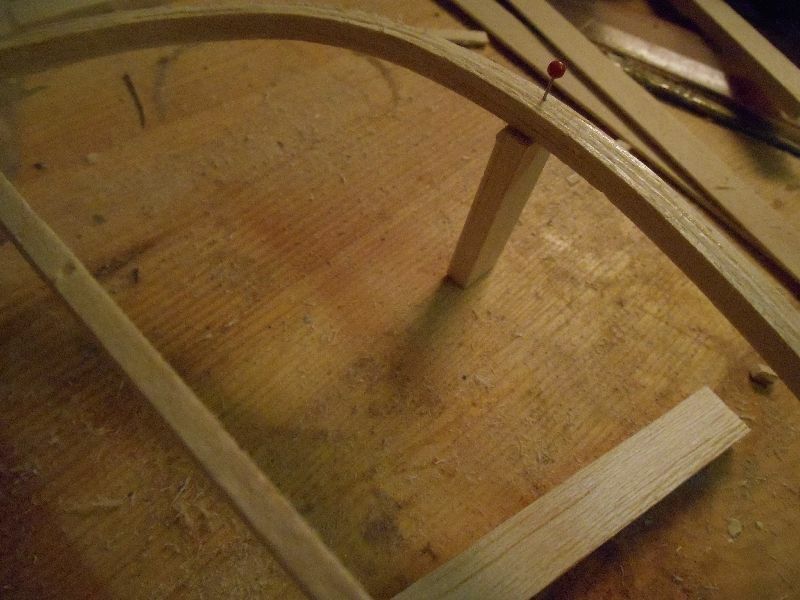 They should bend easily - in fact this is such a wide ratio curve they may go all the way round without damping. However - you do need to wet them. My approach is to spray both sides with water, leave them to soak for a few seconds then wipe off the excess. Put them aside for 10 minutes or so.. While they are absorbing the water, protect the plan and the tip with another piece of cling film - laid on top. I am not going to glue them in place yet. 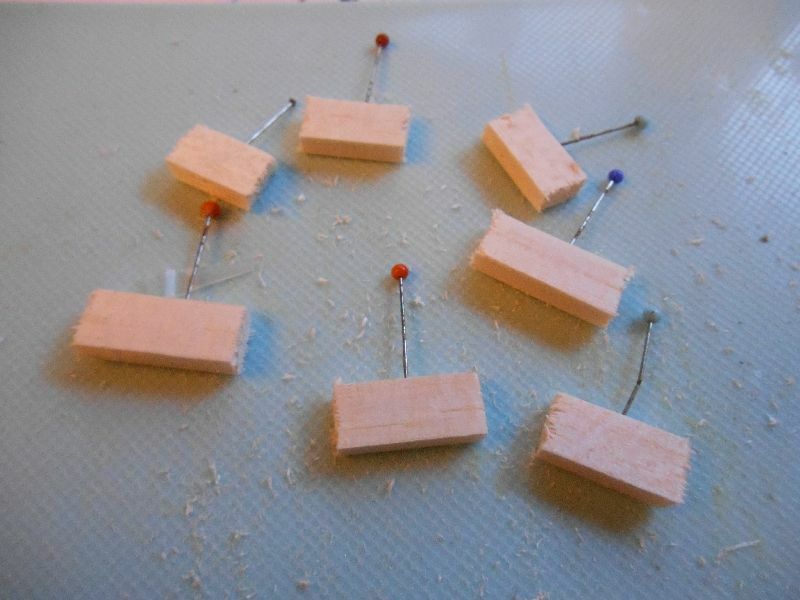 You also need to cut some small blocks of wood and insert pins through. Wipe off any excess water on the strip laminations. Now, starting from in front of the LE, lay the strip of laminations down and hold them in place with a pinned block. Note: the LE and TE have already been trimmed as per the plan. I sliced them to shape using a razor saw..
Work your way around the curve, the laminations will need to slide against each other putting a block down every 50mm or so. Finish off with the last block just past the end of the TE and then leave it to dry.. properly - it will take several hours. A bit more done last night. THE TE joint is flush as you would expect. But - when I place the template over the wing.. The spar slots are too far back. 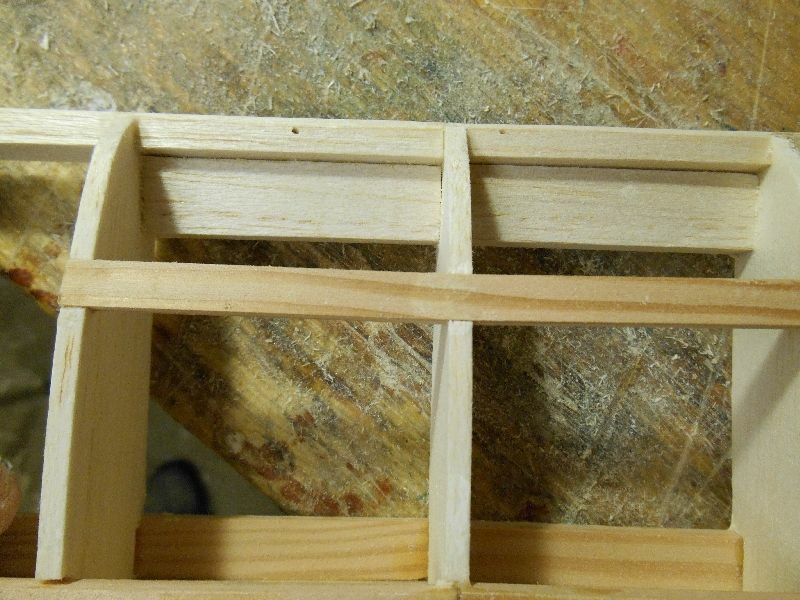 As I haven't actually cut my spar slots in the wing - only marked them, it is not too much of a crisis for me, but you do need to be aware of this and move the rear slots forward by 1/4" if you are planning on building this model..
With the glue dry, you can remove the wing from the plan, trim back the excess off the laminations and admire your handiwork or better, check for problems. Repeat for the Left hand half of the wing. While the glue was drying, I had a think about the wing join. According to the plan, PR appeared to have a single bay flat section with the tips propped up outside the centre bay. You can check this by examining the drawing for the dihedral braces. This actually makes the spar joins and braces quite complex.. 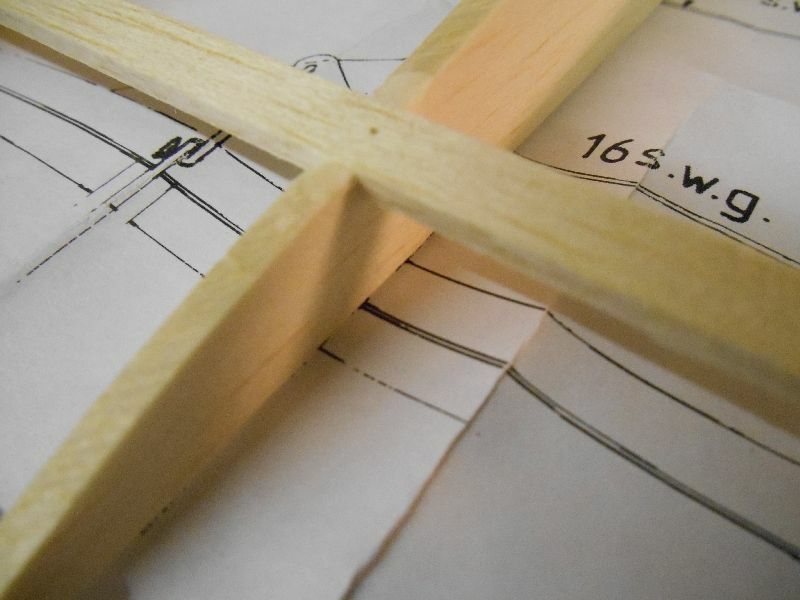 So, I have decided to make the wing a Vee dihedral with a single central joint. 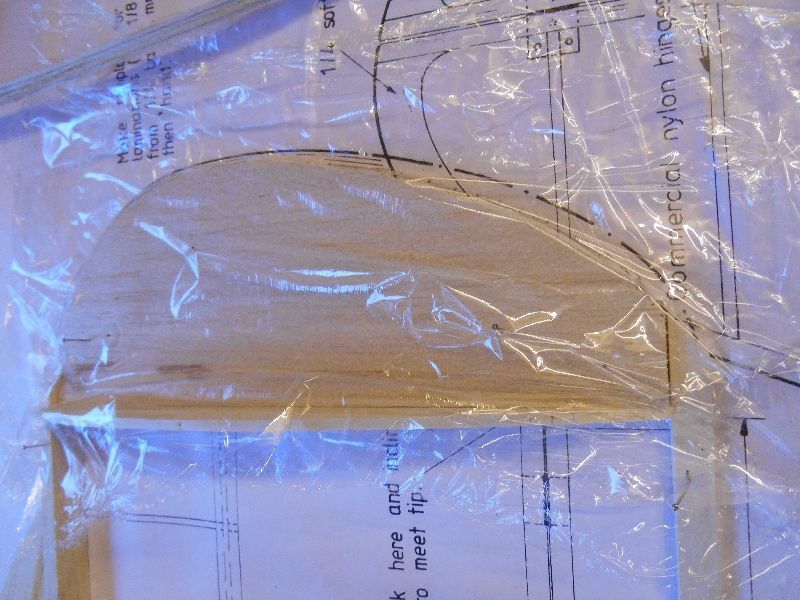 This will mean that the fuselage will need to be slightly modified to support the wing, but this isn't a huge problem. This will be another minor change to the original design..
Moving on - with both wing halves assembled, it is time to join them. Prop up 1 wingtip by 2 inches. 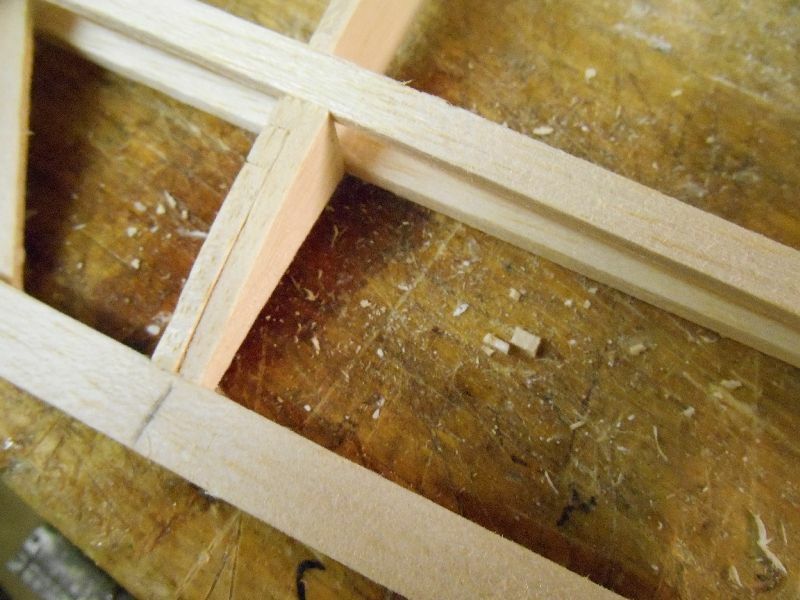 With the wing on the plan, carefully cut/sand the LE and TE on both halves until you get a good joint. 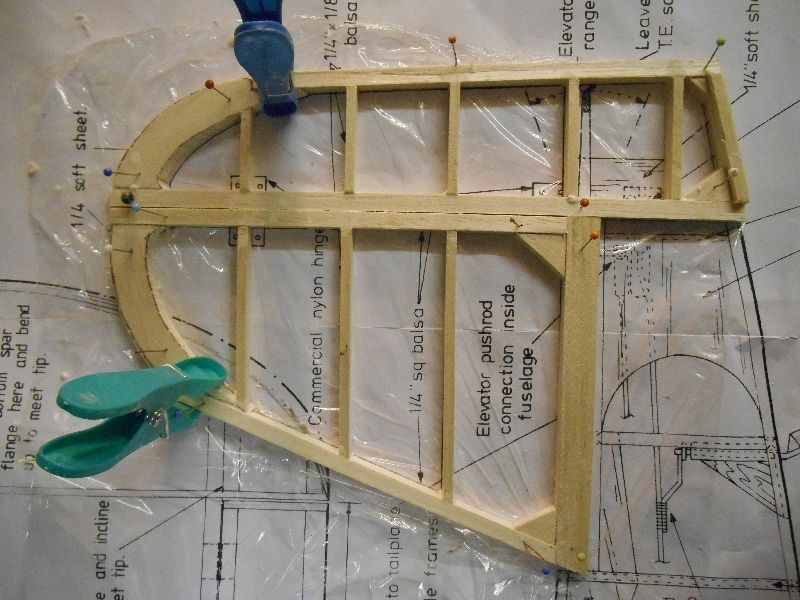 Using a 1m steel rule laid along the LE, also check that wing is not actually swept forward or backwards. Glue the two halves together and fit a centre rib (this is not shown on the plan). 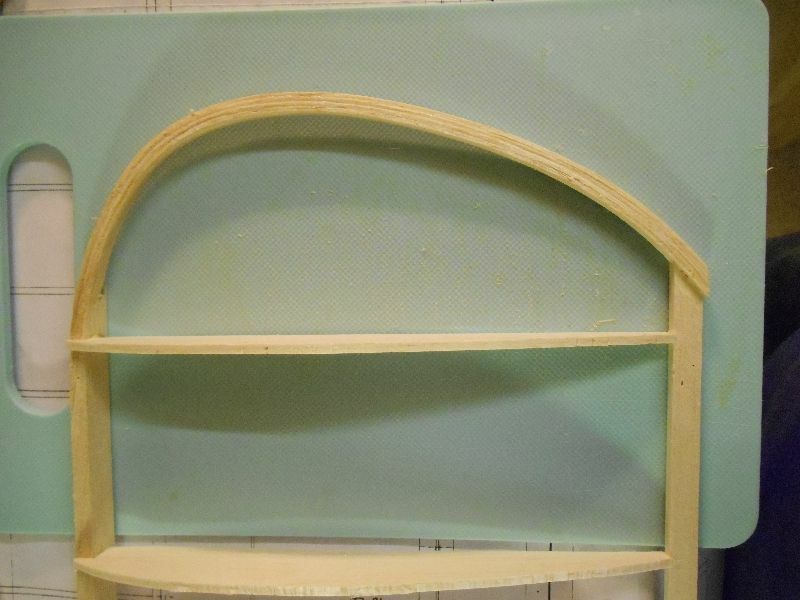 I also added two large 1/16" sheet gussets to support the trailing edge. 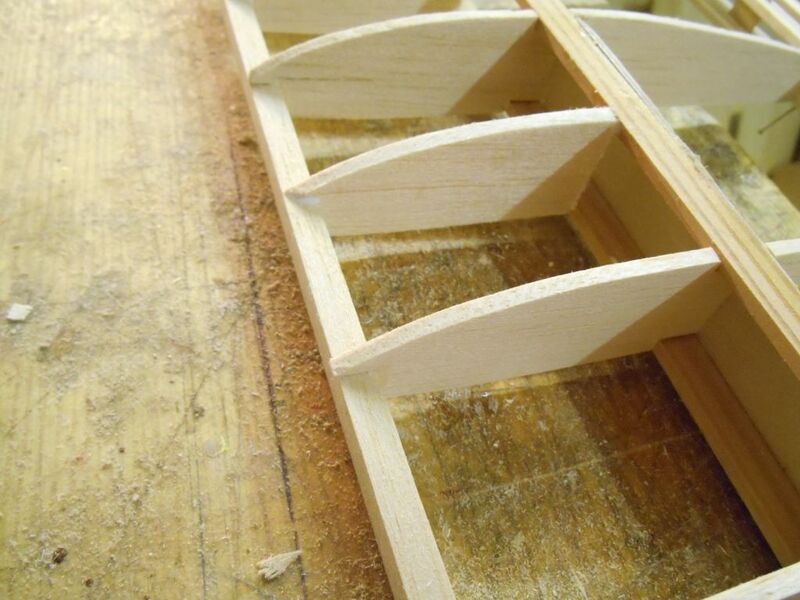 These are centred on the rib so that they will not interfere with the rear spars. You will need to tilt the centre rib so that it is vertical when the wing is in its natural upright position. It only needs to be tilted by a couple of degrees, I did this by eye. Fitting the spars. 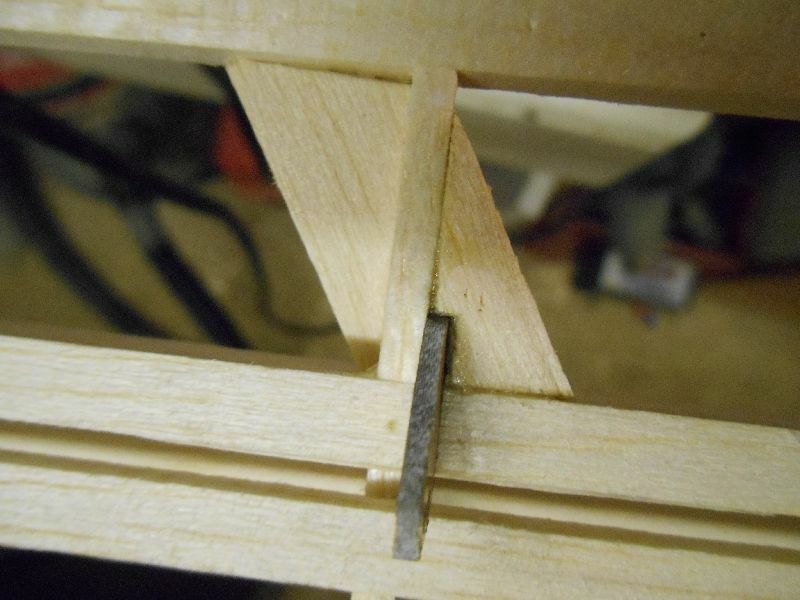 I mentioned that I do not cut spar slots until I am ready to fit the spars. This technique was shown to me by Mike Fantham when I used to fly free flight F1A gliders. Mike went onto become a World Champion so you can assume that he knows what he is talking about. Start with the wing that is pinned down flat. 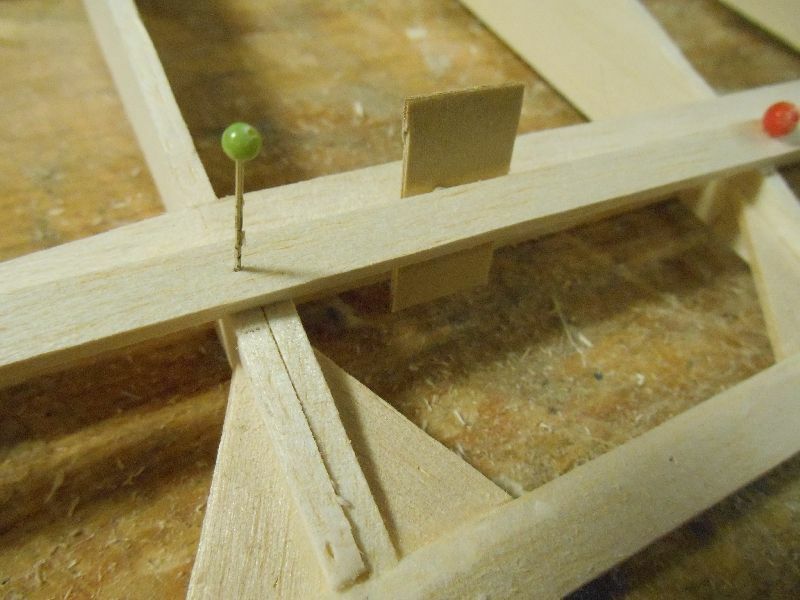 Place the spar over the wing in the correct location and locate with pins at each end. The spar should be nice straights grained with no whorls or curves in the grain but more importantly, it must be straight. Check it against a straight edge. Use a scalpel, mark the front and rear of the rib where it crosses the spar using a slight cut into the rib below the spar. You need to allow for the thickness of the blade, so you will need to cut inwards slightly. You are cutting a 'Vee' but only about 1/32" deep. 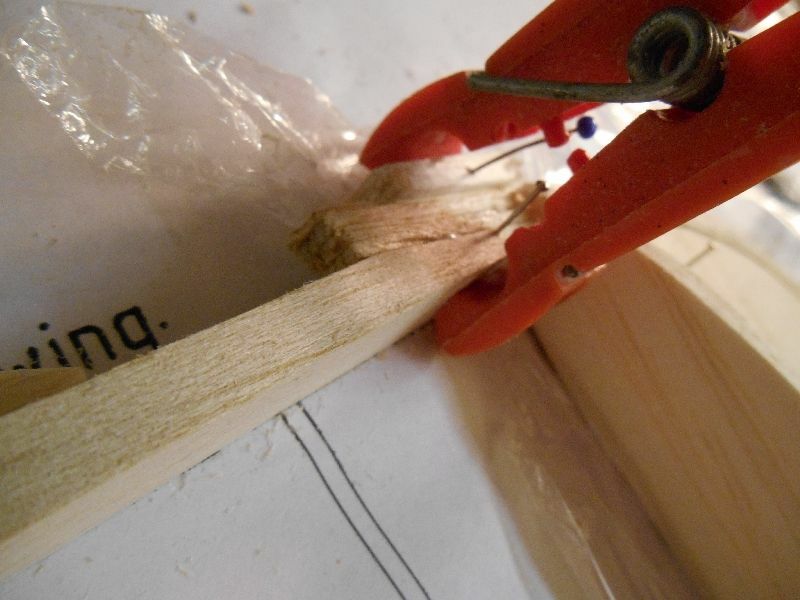 Then, remove the spar and using a short offcut, ease the wood away using the marks you have just made. After a couple, you will get very good at judging 1/8" deep. Each one will only take a few seconds to cut. 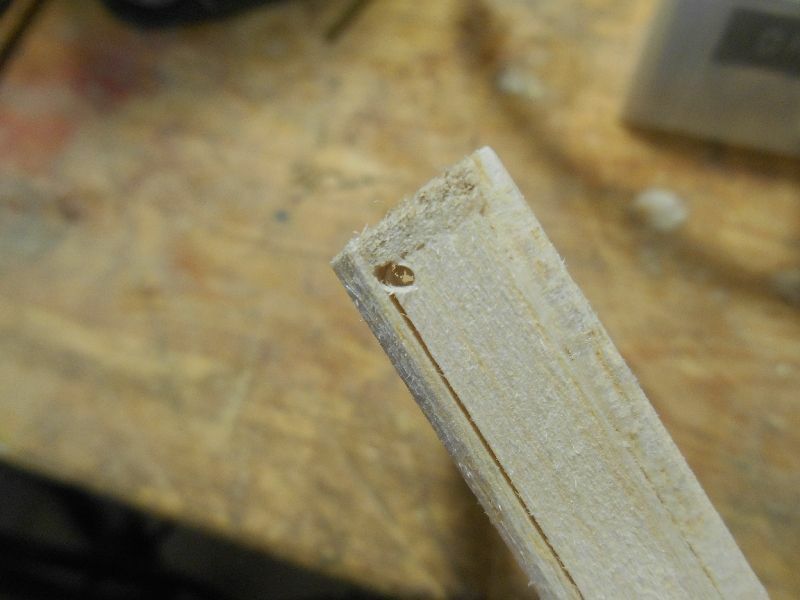 Use the offcut to check for a good fit. 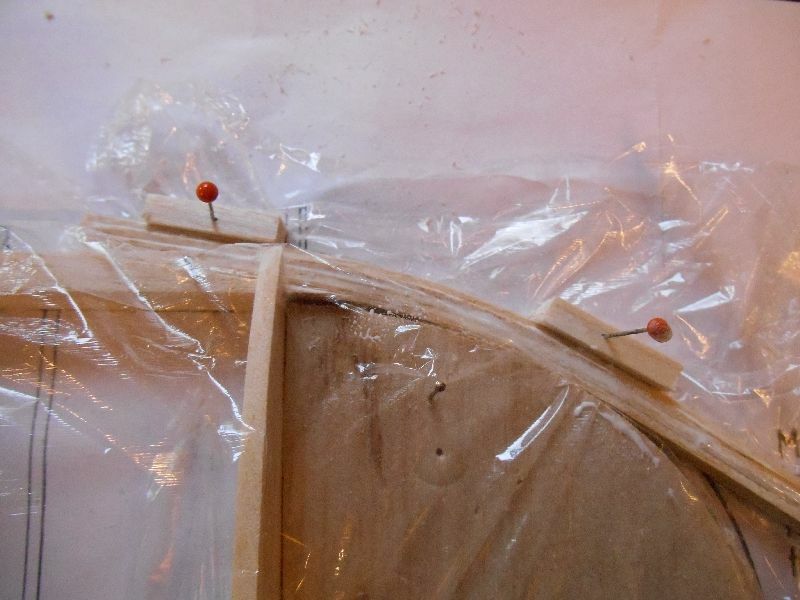 Check fit, cut the spar to the correct length and glue into place. You should have a well fitted spar which has put no strain on the wing. Basically, use the same process for fitting the rear spar. 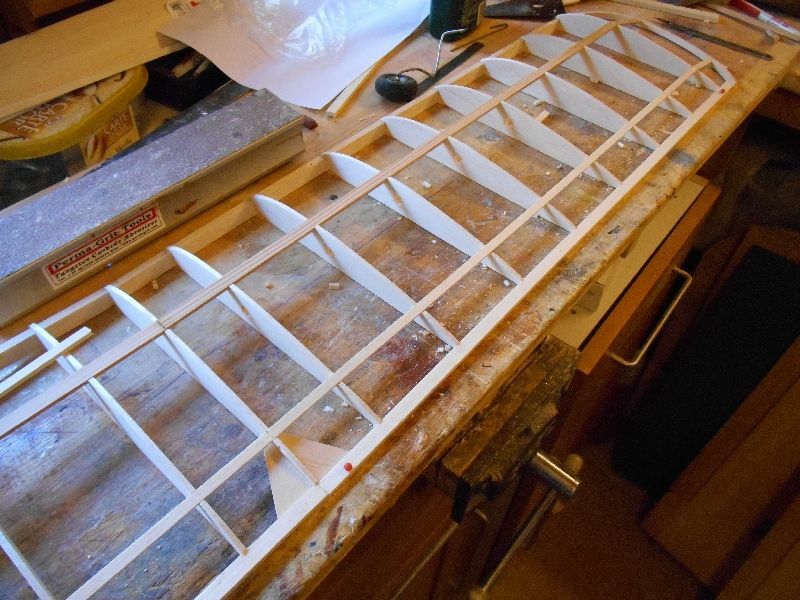 The rear spar actually comprises of two spars (top and bottom - 4 in total) that will define the separation point for flaps and ailerons. We are fitting the rear wing spar first. 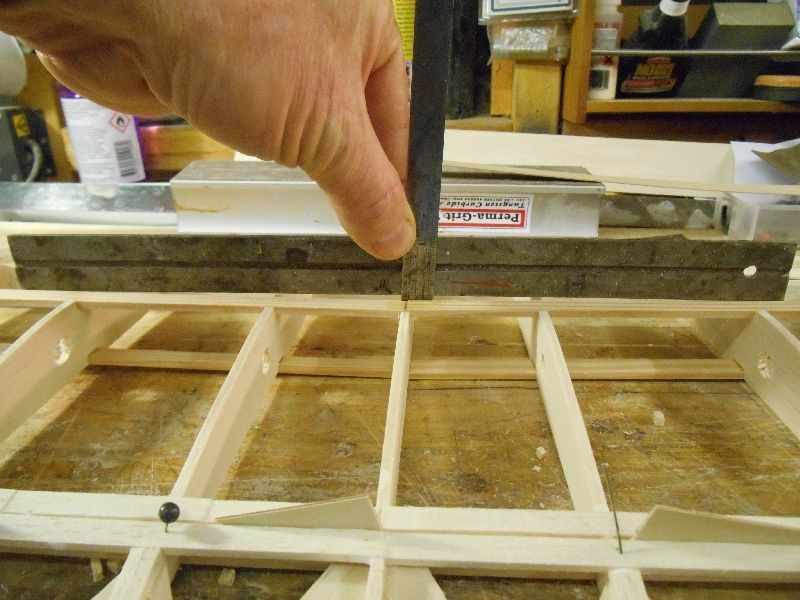 Place the spar over the wing in the correct position and use a straight edge while locating the balsa spars. It is very easy to introduce a curve if you are not careful. 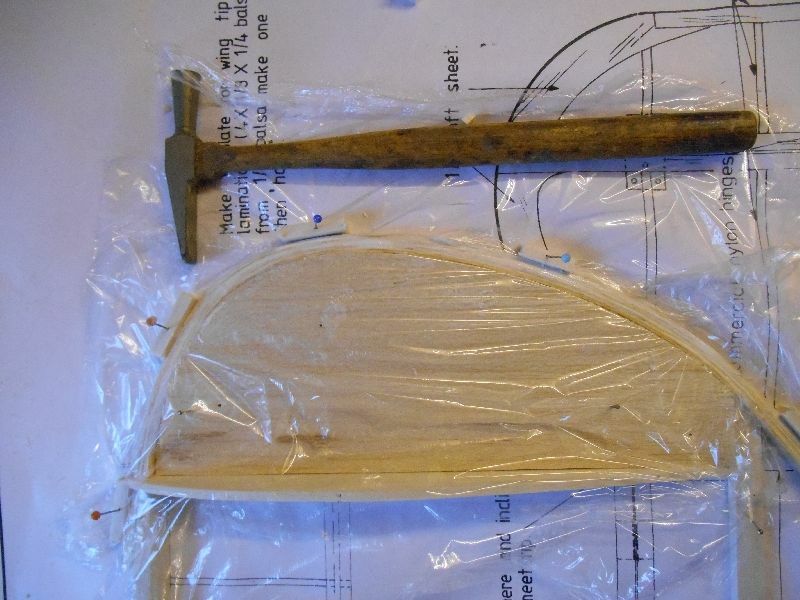 Mark and cut as above and fit and again you should end up with a well fitted spar with slots cut for the material you are actually using, not some arbitrary size issued by the model shop that may not actually be what PR intended or the draughtsman actually drew. This may seem time consuming, but from experience it is just as quick as cutting the slots out using a template. It works well for me anyway.. Some very useful hints and tips for beginners like me there Martyn. Many thanks for the detailed description of the build. This where I am up to with the wing. 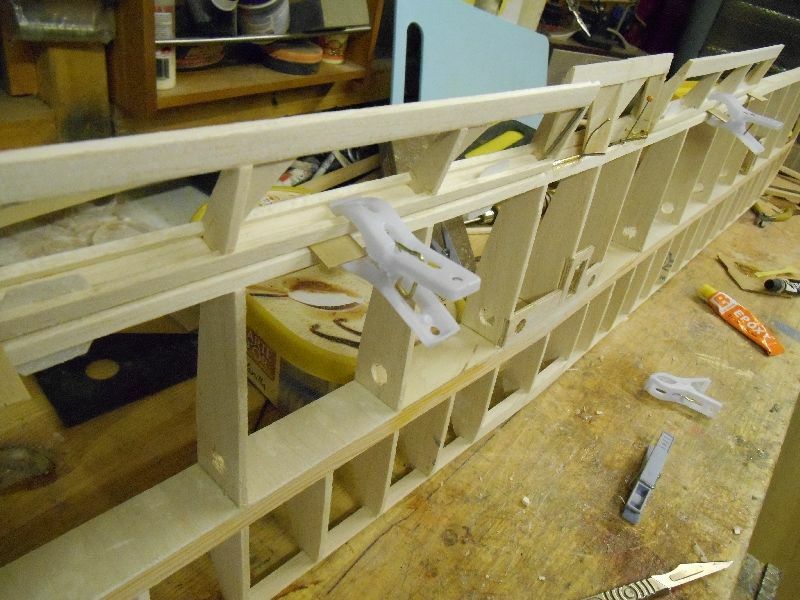 and then the lower balsa rear spar. 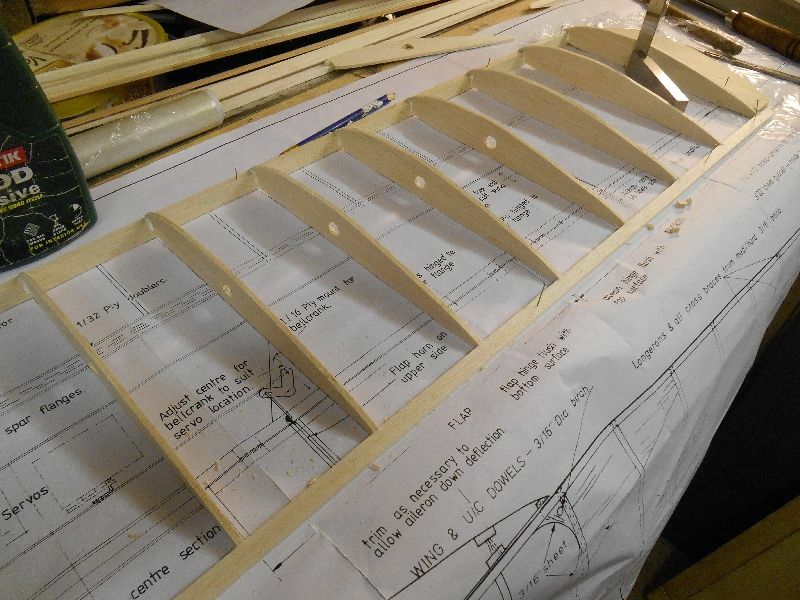 Before we can start on the flaps and ailerons, we will need 6 little riblets that will sit between the rear spars and the trailing edge. 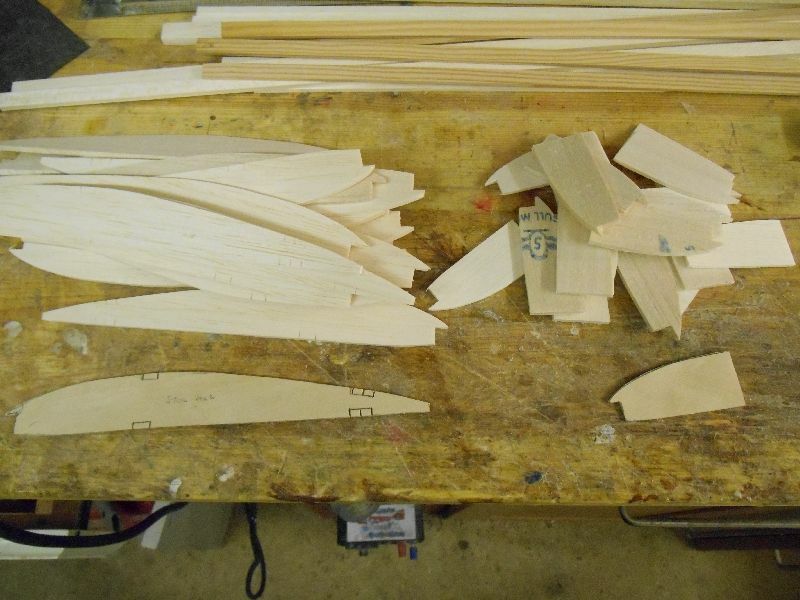 Along with the existing ribs, these will be the boundary ribs for the flaps and ailerons. Its best to cut these from the main template, but too large and trim them to size. They are located at the outer aileron edge and the inner and outer flap edges. The inner aileron edge is defined by an existing wing rib. I like gussets - it comes from my free flight pedigree where they are used very extensively. Especially on relatively light open structures like this. They add a lot of strength, some anti warp capability and actually make people think you think you know what you may be doing (it's all bluff though). I have decided to place a gusset against each TE junction with a rib or riblet. This is how you cut gussets accurately. The grain should always be along the long edge of the triangle and you should not cut scallops into them. They may look nice but you are defeating the object of the gusset which is structurally to transfer a load from the rib to the TE or vice versa. 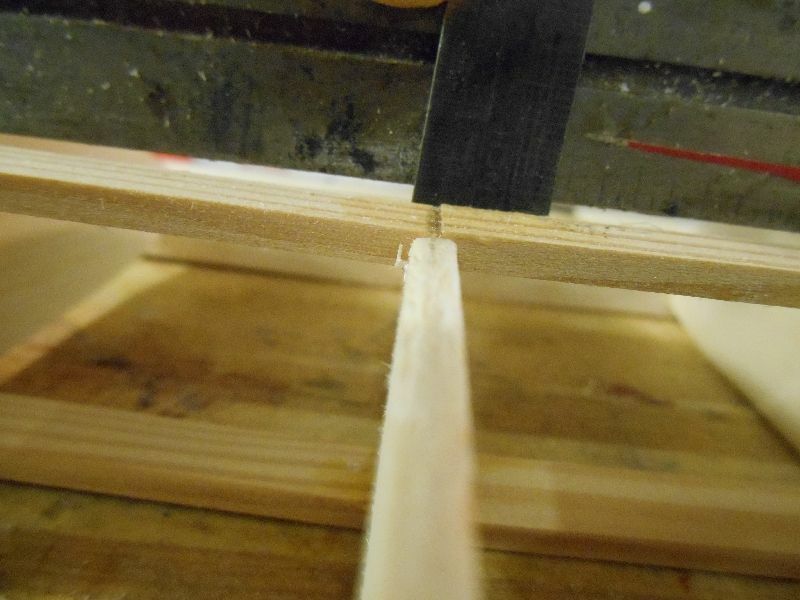 Cut a strip of 1.5mm balsa about 20mm wide. You will need a mathematical geometry square - I use 60/30 but a 45/45 will give you good symmetrical gussets as well. 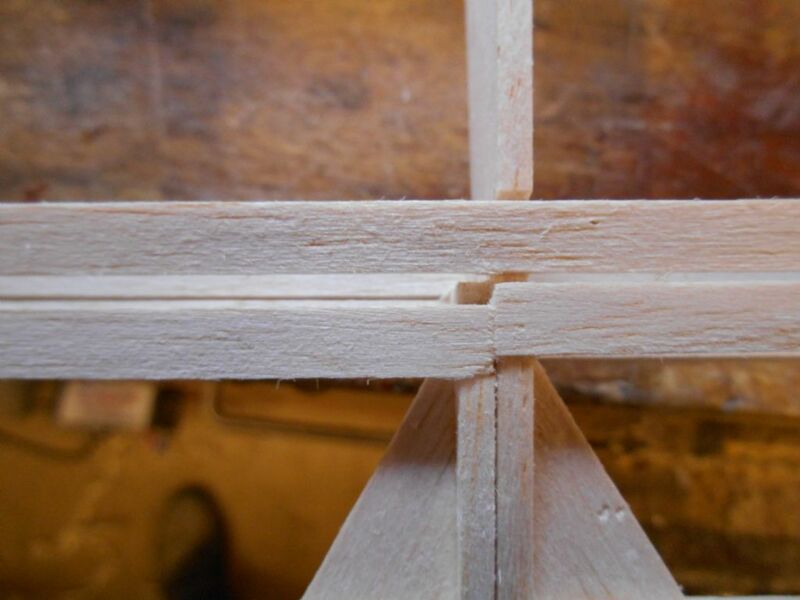 Basically, you place a steel straight edge against the side of the wood, lay the square over the wood and slice one edge. Rotate the square (in the case clockwise) by 90 degrees, line it up with the edge you have just cut and slice a gusset off. Rotate the square anticlockwise by 90 degrees, move it along to the edge of the triangle you have just cut and slice - and another gusset appears. 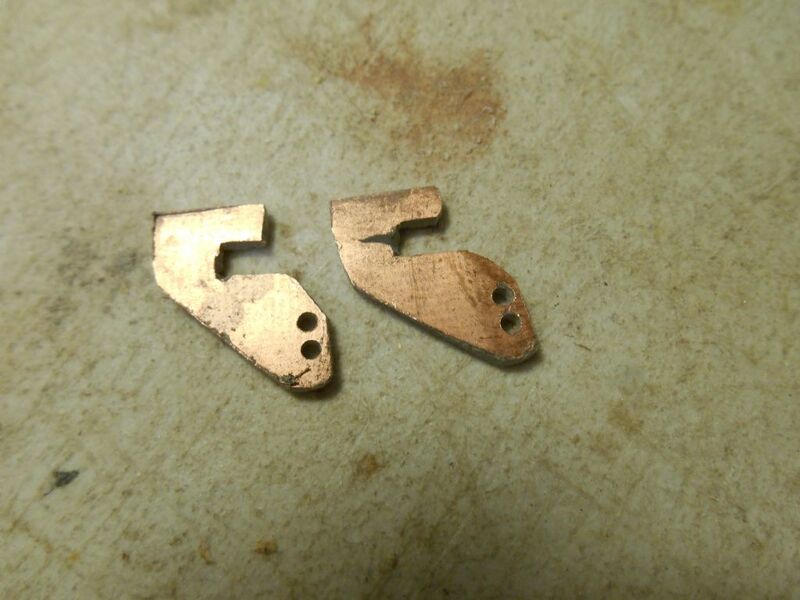 20 gussets can easily be cut in less that 2 minutes - all accurate and all identical.. Glue them in place. They sit half way down the depth of the rib and on the centre of the trailing edge. You can see where I have a reverse gusset on the edge of the flap boundary. Now need to add the front Flap and Aileron spars. 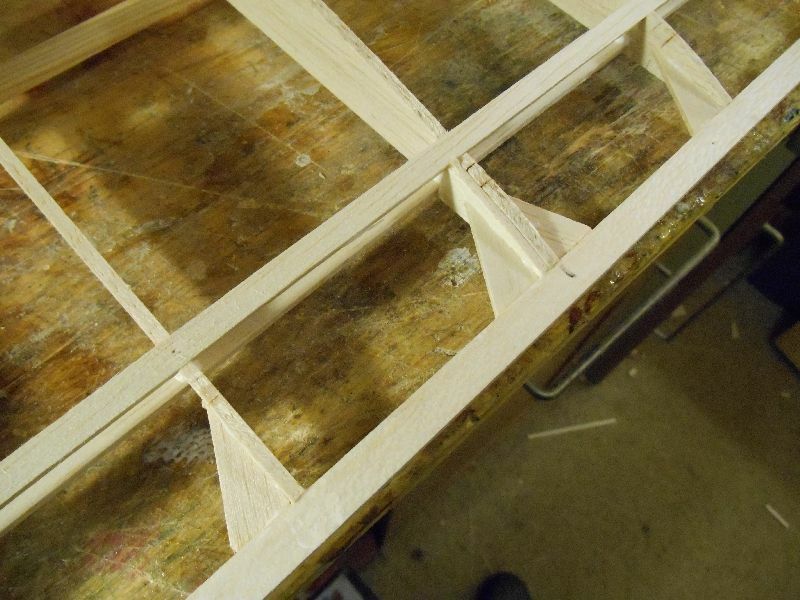 We will need to put a small gap between the rear spar and the flap/aileron spar/LE so I can separate them with a Razor saw. 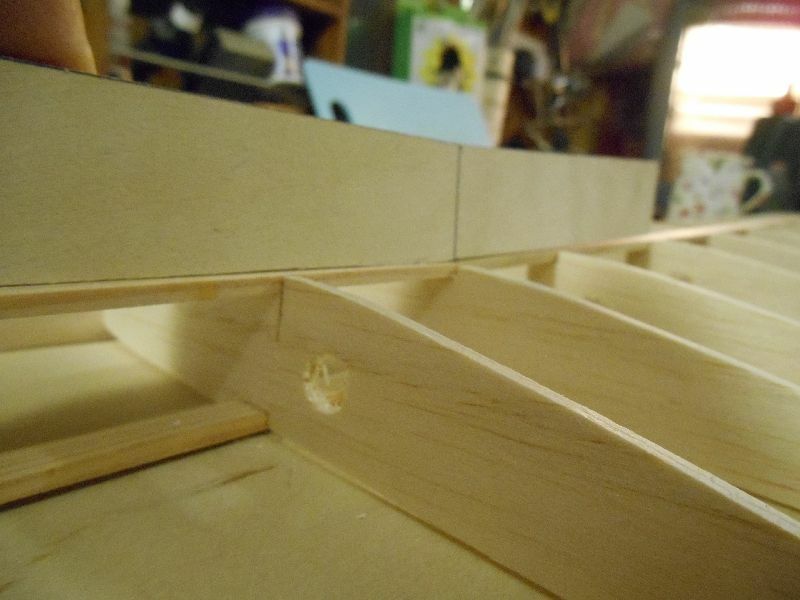 So before you pin down the upper spar pack it out with some offcuts of 1/32" ply. 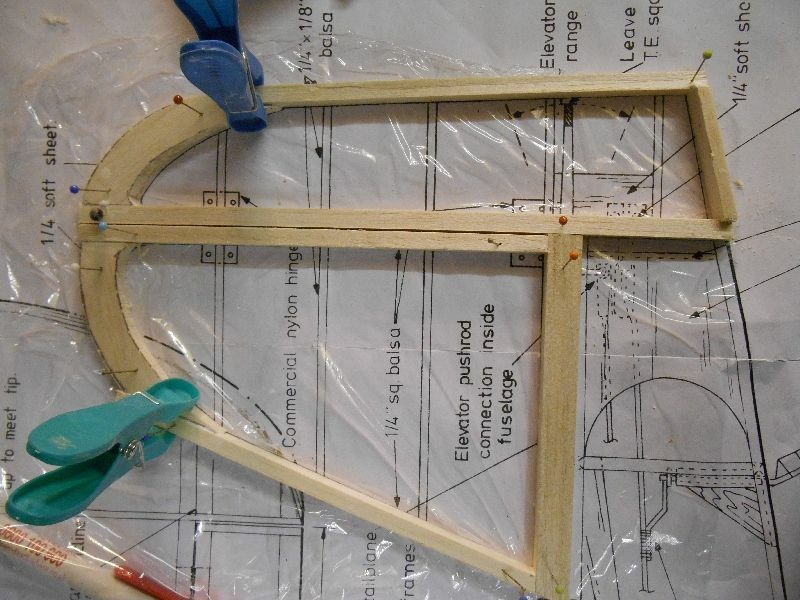 We can now start on the wing brace. 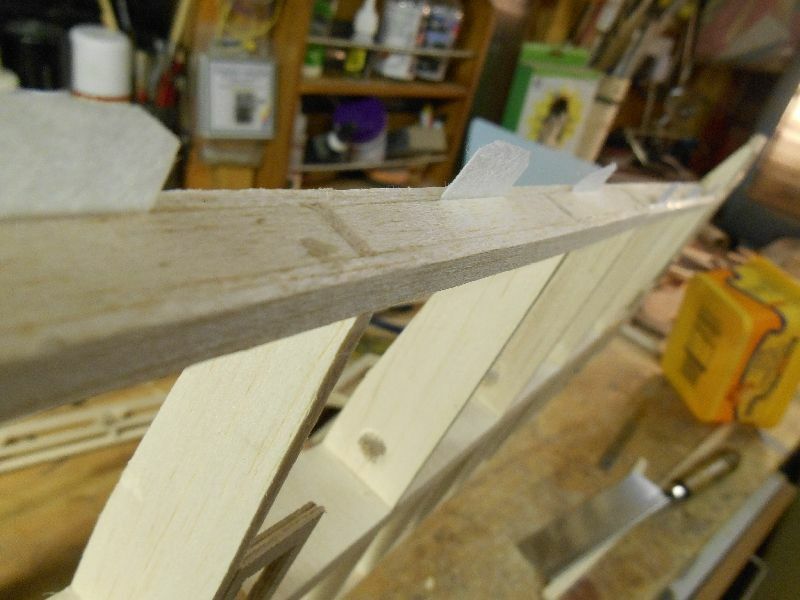 The plan shows 4 off 1/32" ply braces, 2 of on each side of the upper and lower main spars. 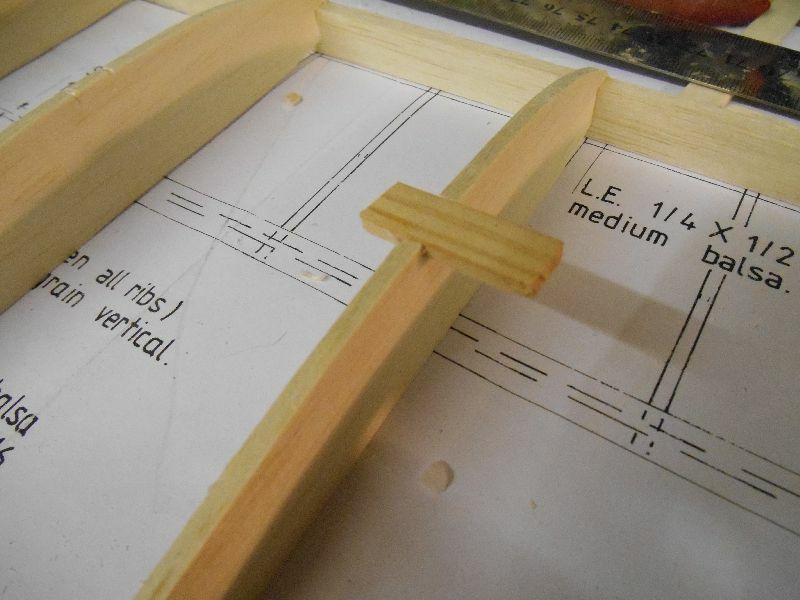 I have chosen to put a full depth 1/16" ply brace at the rear of the spars. One thing I always do when I cut dihedral braces is to measure and cut them to fit. It is much more accurate than trying to get the layout from a plan and accommodates any (err) variations that you may have introduced. The brace goes out 2 bays from the centre rib (remember I have added a centre rib not shown on the plan), the plan shows the brace covering the centre 3 bays - which is the same distance that my brace will cover. More to come. 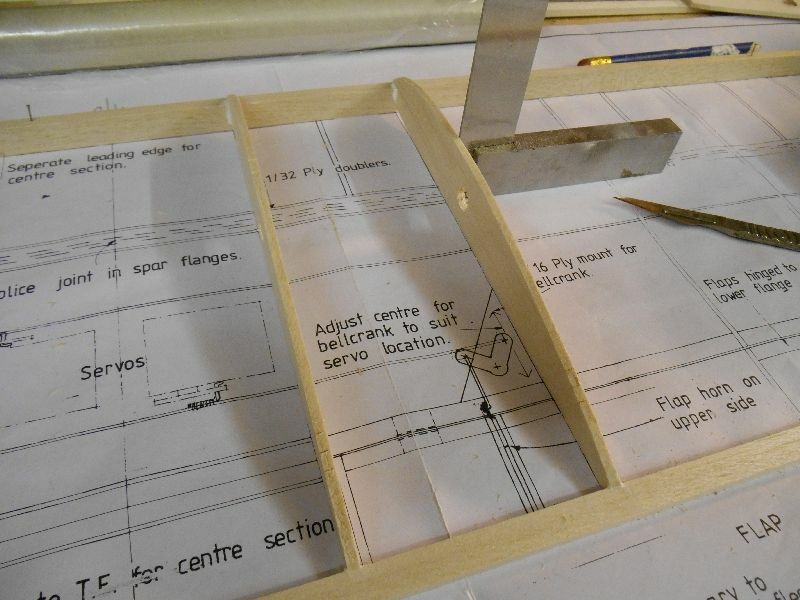 The next bit will be cutting off the ailerons and flaps - A bit of planning is required first though. Don't mind me watching, I need to learn as much as I can. 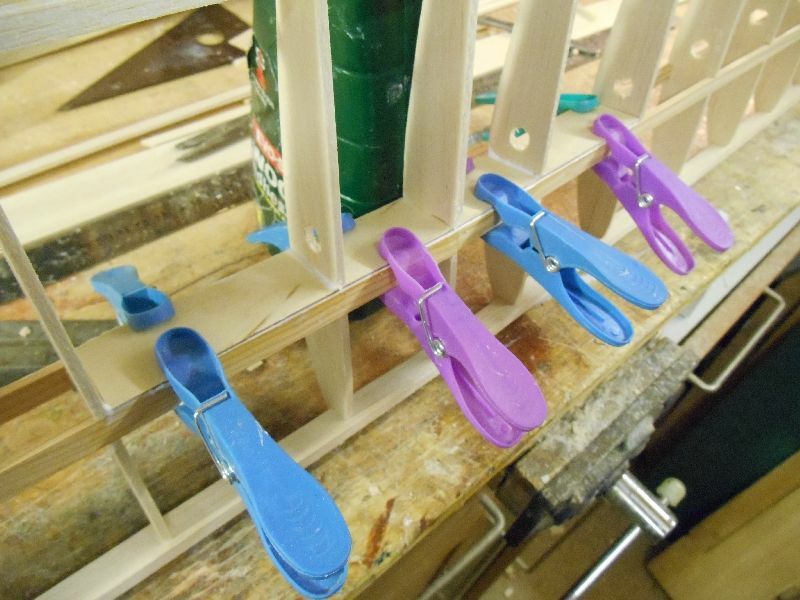 I like the way you fit the spars What pegs are you using ? The ones I've got leave dimples due to springs being too strong. The pegs came from Asda IIRC - they were a couple of pounds for 24ish, I cant really remember. They have a nice broad contact area so will not leave marks unless the wood is very soft. Nice and colourful as well. I have also got some very soft camping pegs - totally useless for hanging clothes but they are the most gentle clamp I have ever seen. 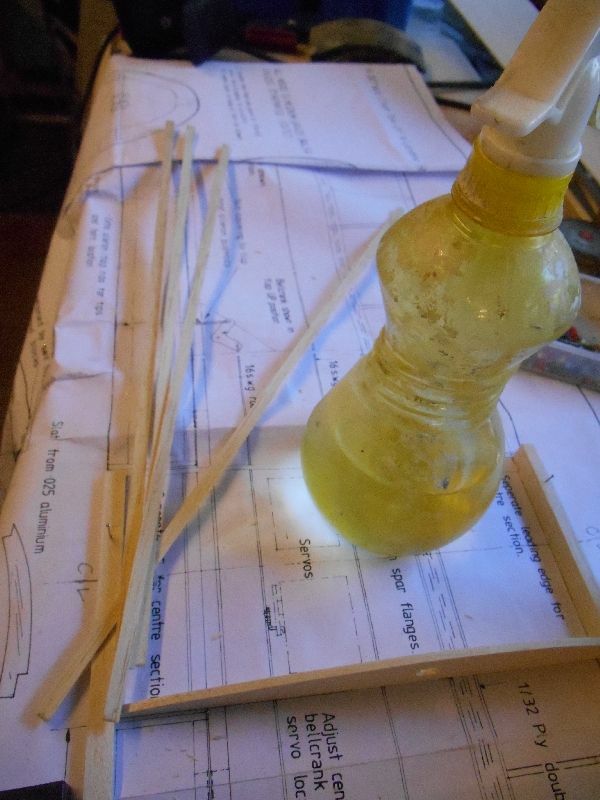 Great when working with very light/soft balsa. One of the reasons why PR deemed that tis was not a beginners model was because a lot of the implementation decisions have been left to the builder. 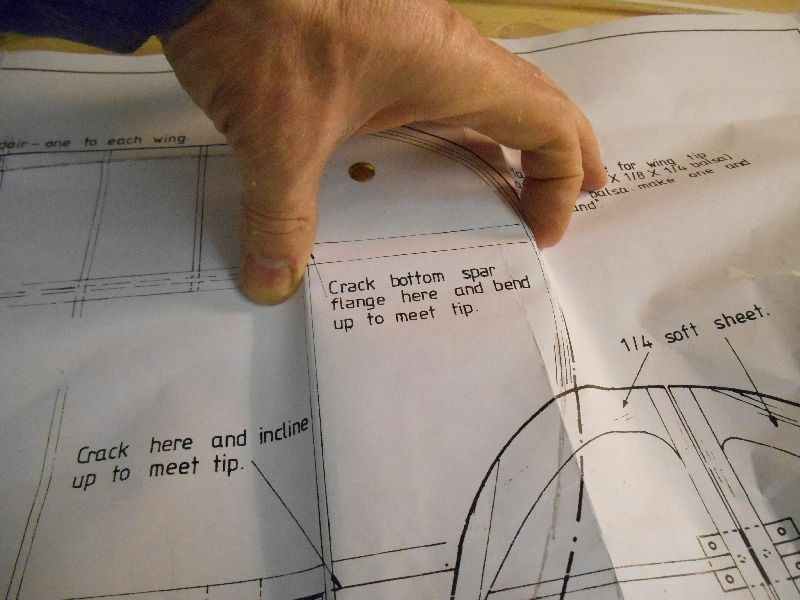 The instructions for attaching the flaps and ailerons is simple. "Hinge Ailerons on the Upper Surface, Hinge Flaps on the lower surface"
This implies that tape or film will be used to attach the moving surfaces - something I really dislike doing. Additionally, very little thought by PR on what needs to be changed on the wing to allow an aileron to deflect up and down. This is an enlarged scan of the wing section at the junction of the ailerons. 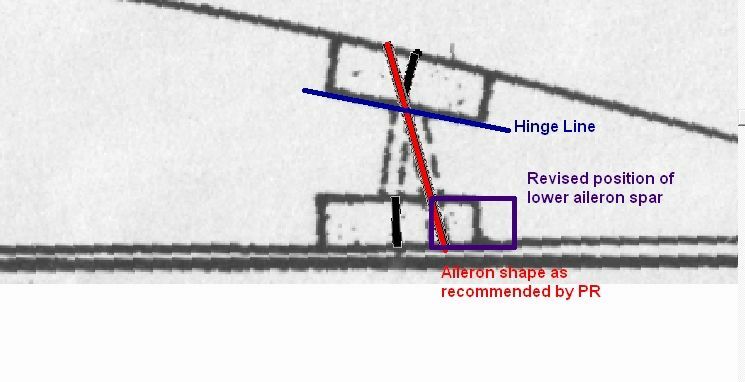 You can see where PR has suggested that the aileron wood and spars would need to be removed to get the (unstated) aileron travel. If you follow his guidance to the letter, you will end up with a lower spar about 3/32" wide - which I believe is too little. 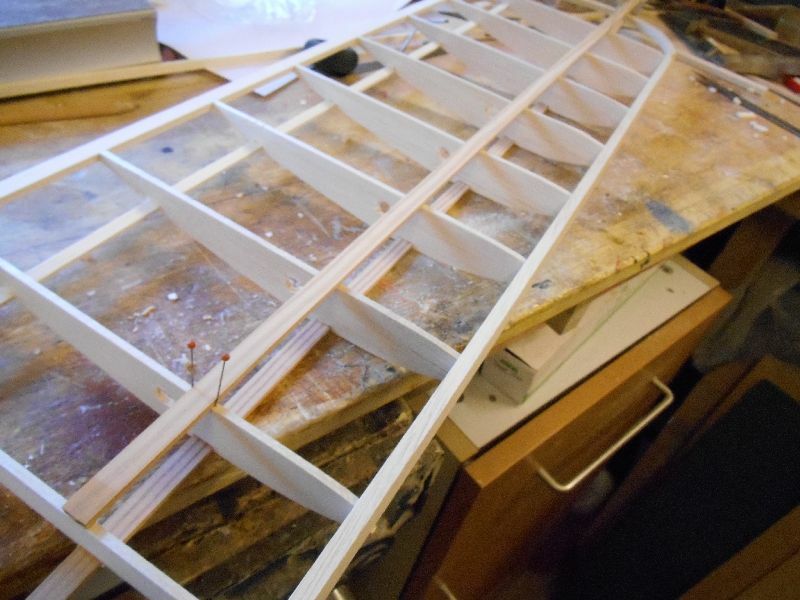 My plan therefore is to hinge the aileron under the upper rear spar and on the ailerons and move the lower aileron spar back about 1/8" to restore the full width of the spar. The flaps are a little more straightforward. 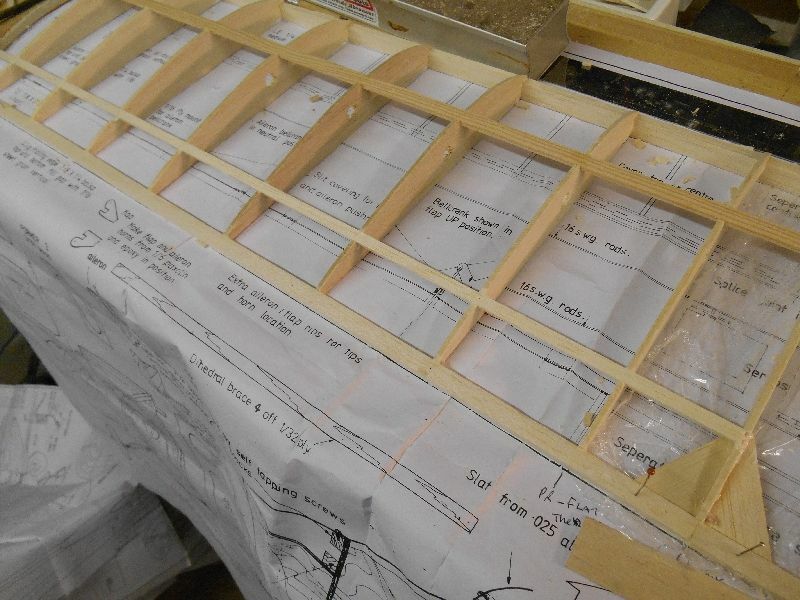 Here, I will hinge on the upper side of the lower spar and cut a 45 degree chamfer into the wing spar and the flap spar (which is in the position as marked to allow up to 90 degrees down flap..
That's the plan anyway.. If I am good, I'll get an hour in the shed tonight to have a crack at this, if I am bad, I'll get all night to get it sorted..
Will be taking notes ready for the Cub build! Looking very tidy so far. No go do something really bad & get back in the shed! A little bit more done over the weekend - clearly I wasn't naughty enough or I have a very forgiving wife. Probably the former is true. Next job.. fitting the lower flap spars. 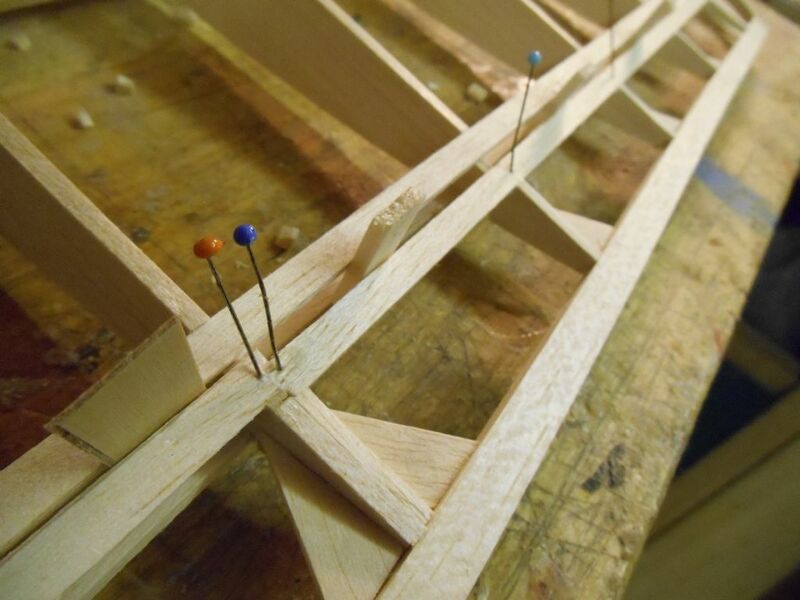 Using the same technique again, pack and pin the lower flap spar - 3 bays and cut the slots. 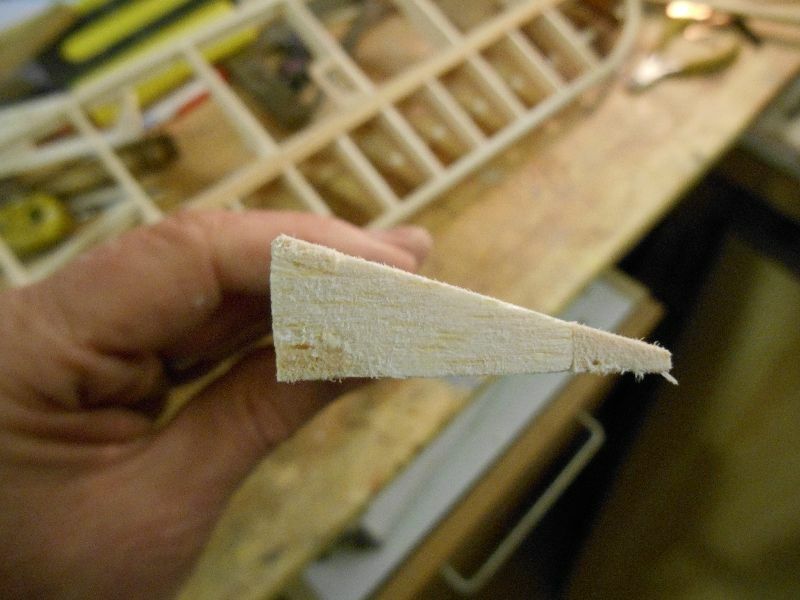 You will need to be careful at the junction of the flap and aileron that you only cut into the inner part rib. However - if you do get it wrong, its not a disaster as we will be taking that wood away anyway. 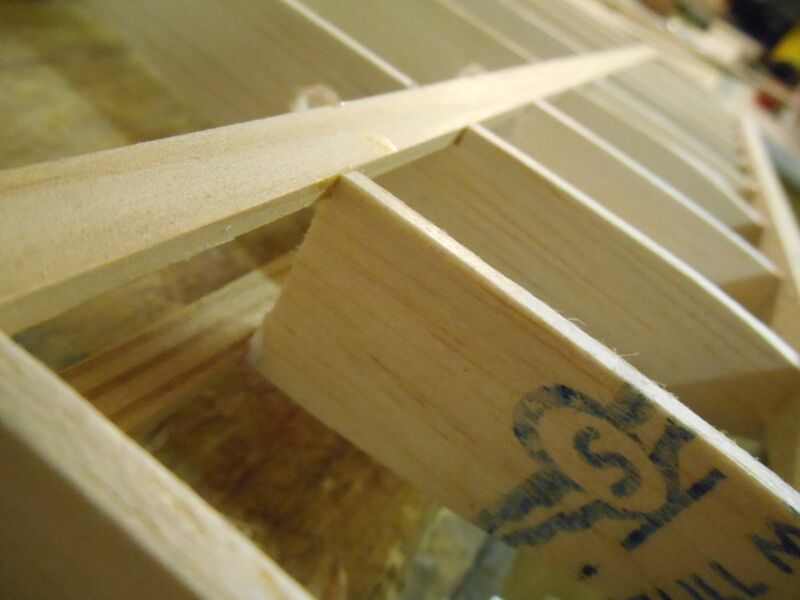 Glue the spars into place and then we pack/mark/cut the lower aileron spars. 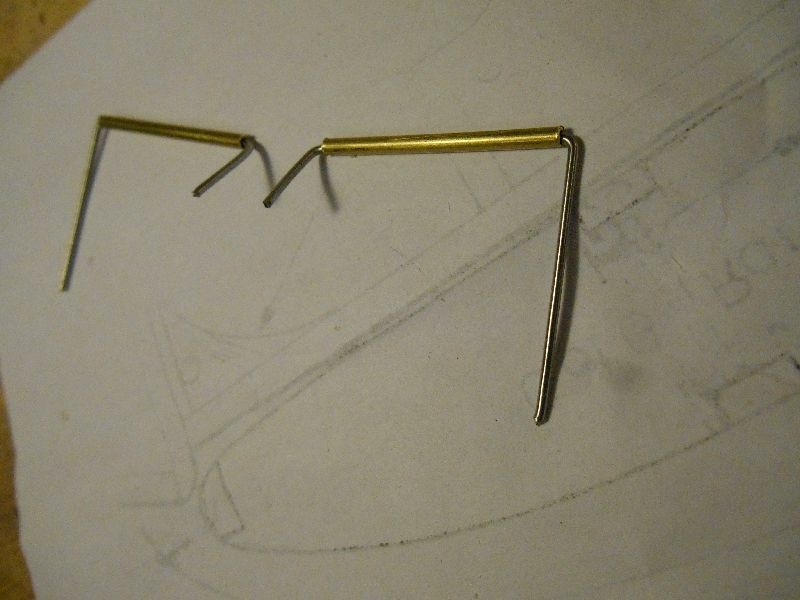 These are packed out with some 1/8" balsa to give me the desired gap. 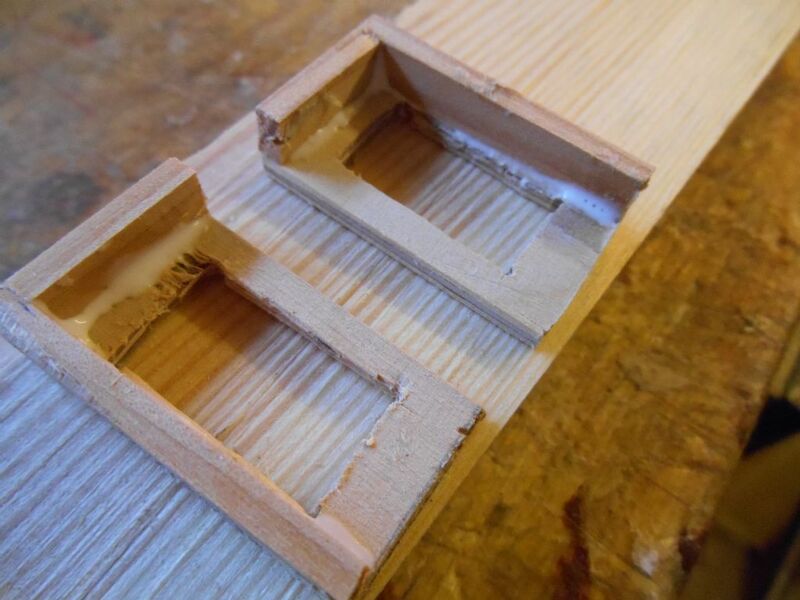 By now, you will have realised that one big benefit of cutting spar slots in this manner is that you can be very flexible as you are building just where you want those spars to be located. Now you will have to be careful with the aileron to flap junction.. While the glue was drying, I fitted the half ribs. These had all been cut marginally too wide - by a couple of mm - and were sanded back to a snug fit. 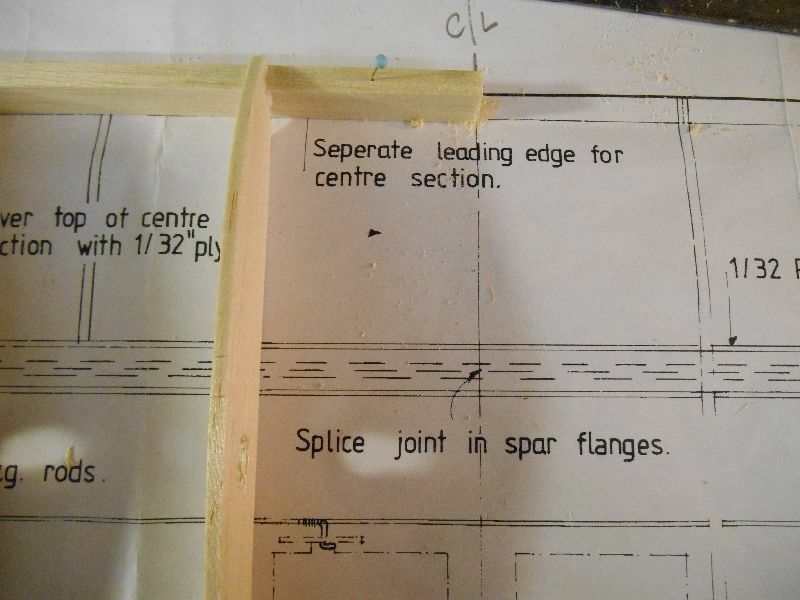 Note - they are just butted against the spars - I haven't bothered trying to cut an insert into the flange. 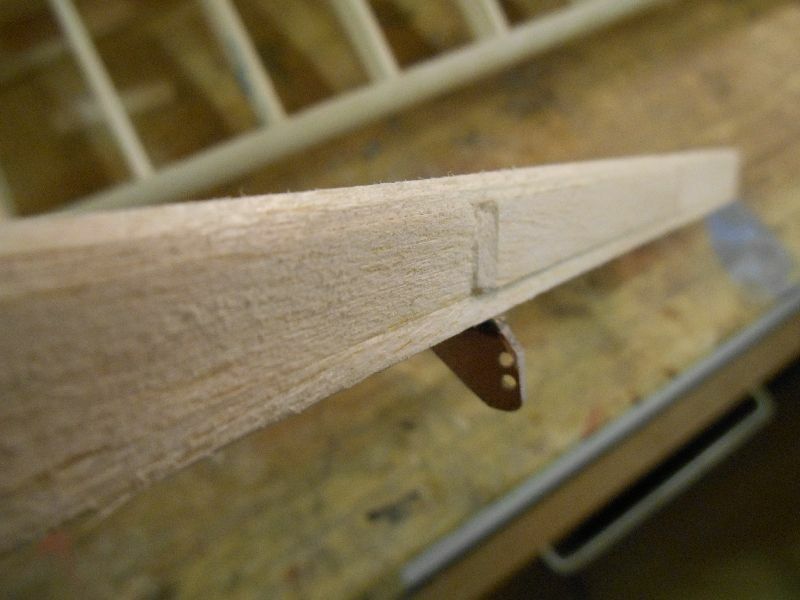 And after about 30 mins or so.. check the join on the lower edge to make sure that the rib sits flush with the spar - they can get crushed slightly in fitting and leave a very annoying 0.5mm step that will show when you cover the wing. I very rarely build a true "I" beam spar. I find it easier/more accurate and more importantly much easier to check that its is accurate - if the web is simply placed against the edge of the upper and lower spars. Webs should be inserted with the grain vertical. 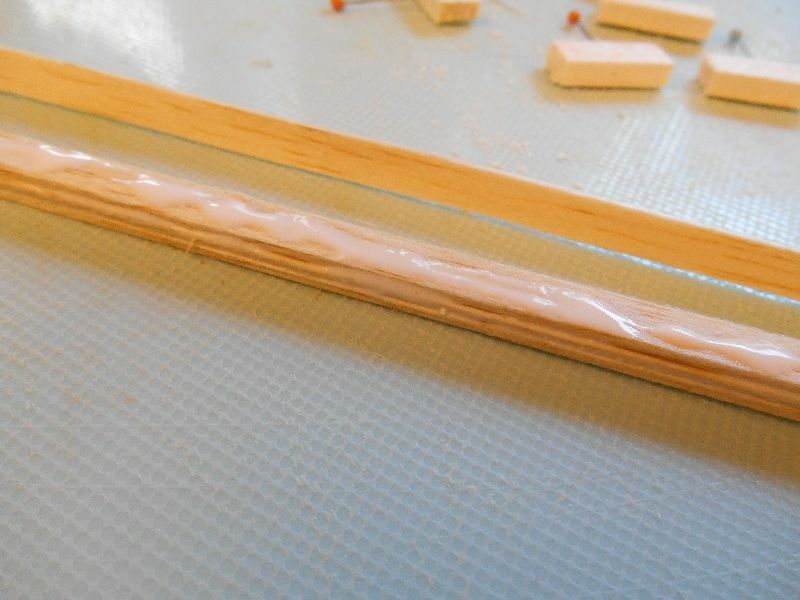 Their purpose in life is to prevent the spars buckling under load and balsa is much stronger in compression with the load against the direction of the grain. 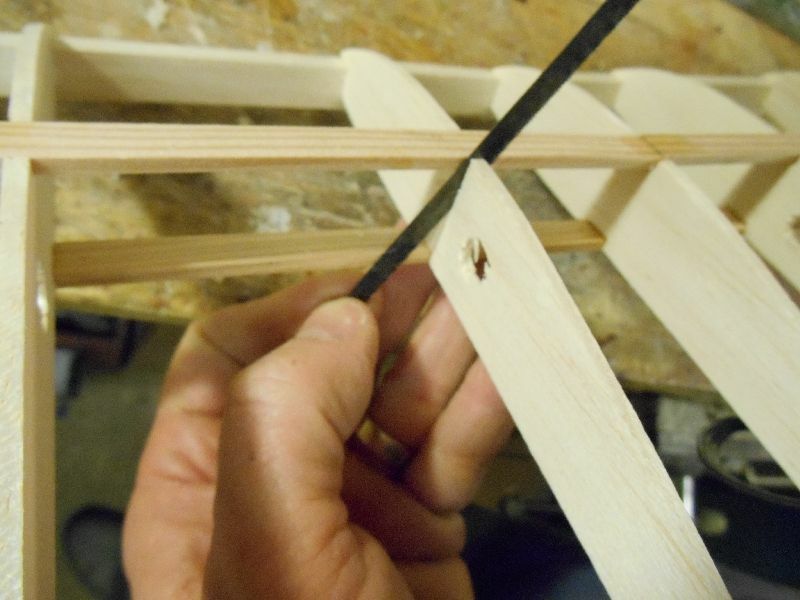 The trick here is to measure the gaps between your wing ribs and find the biggest gap - they will all vary by 0.5mm or so - then cut a strip of balsa to that larger width. Push the wing down flat on the board, push the web down then mark and cut the upper surface. 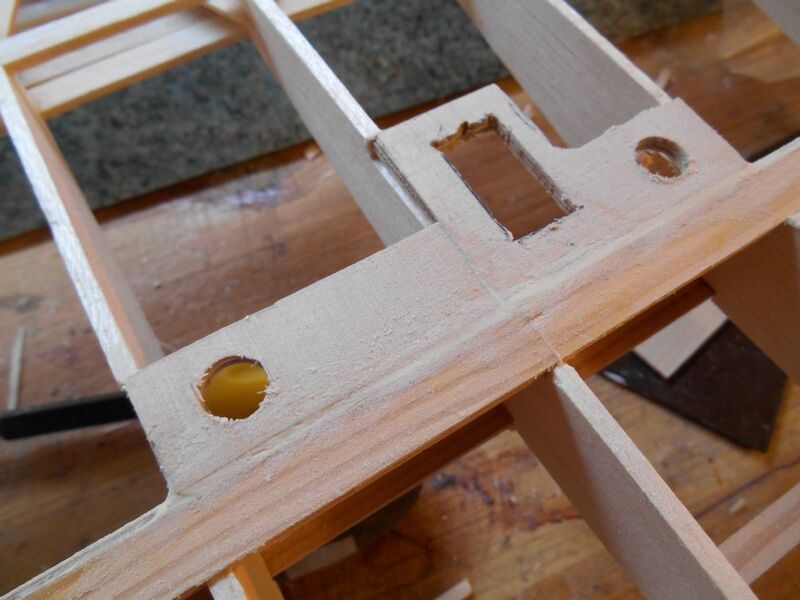 If necessary, trim the width to a good fit and glue into place. As my dihedral brace is fastened to the rear of the spar and I now have riblets in place then my web is located on the rear of the spars. Marking and trimming to fit. If the wing is constant thickness - like this, I use an engineers square to cut the flange at 90 degrees using the single stab mark with the scalpel as a reference. Sorry - not the best photo.. 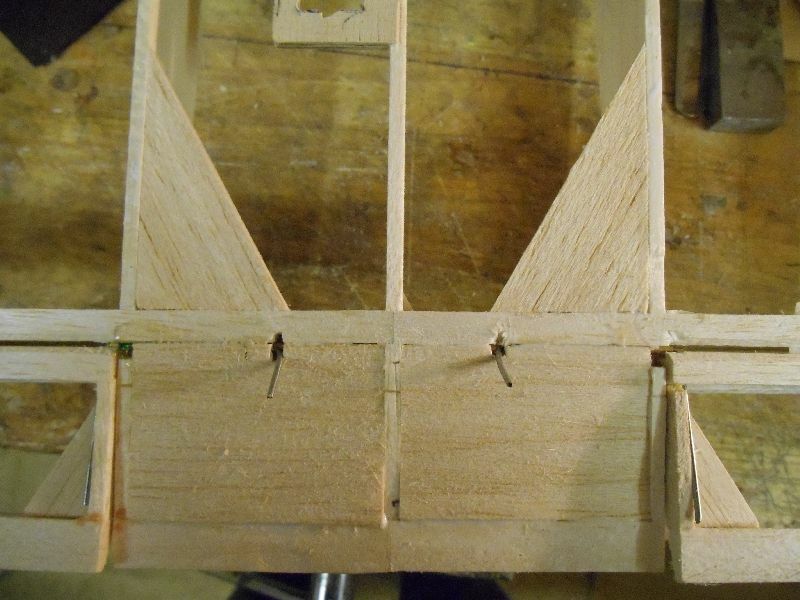 These sit around the lower aileron spar, but importantly, with the linkage holes located directly below the hinge line. If they are displaced excessively in either direction then you will have unwanted aileron differential built in. 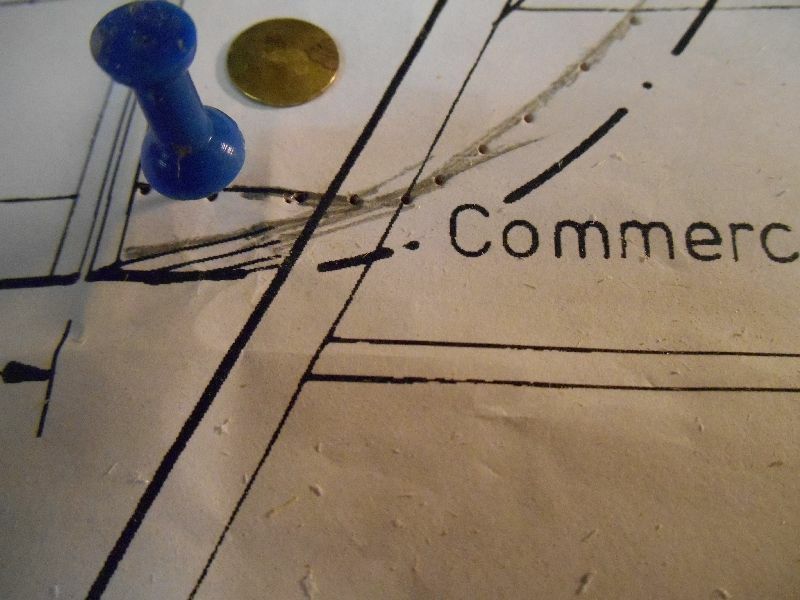 Its much better to mage differential at the servo or in the linkages..
Cut from 1.6mm Glass Printed Circuit board. 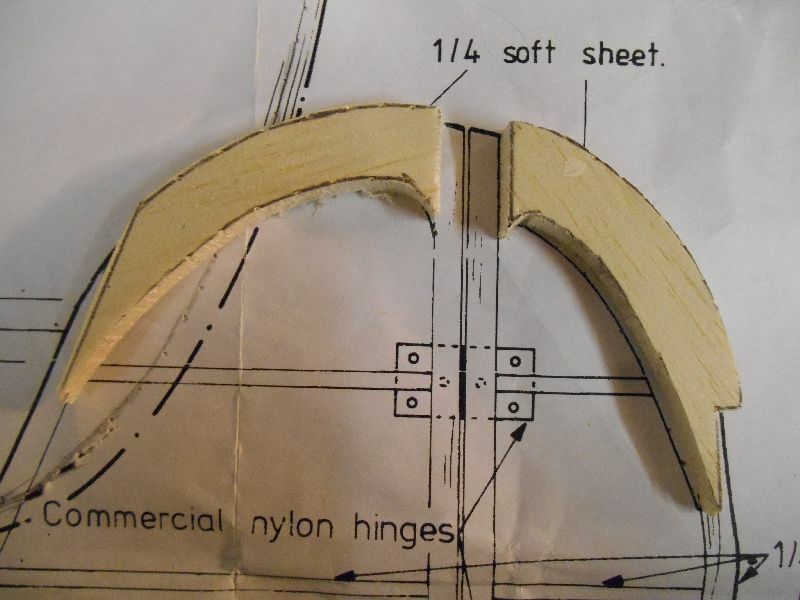 With a 1/16" gusset between the rib and the spar surrounding the horn. I'll take a photo to show this, but this is used for the film to stick to and provide a little extra strength in this area. Finally for now, Servo mounting. The ailerons will have one servo for each wing - I am using Turnigy MG-90S servos which I find to be more than adequate for models of this size. These are marked up and the corners drilled. You can either cut through using a sharp Stanley type knife of chain drill the holes out and sand/file to size. Note that I am cutting to waste and I'll fit the servo properly. 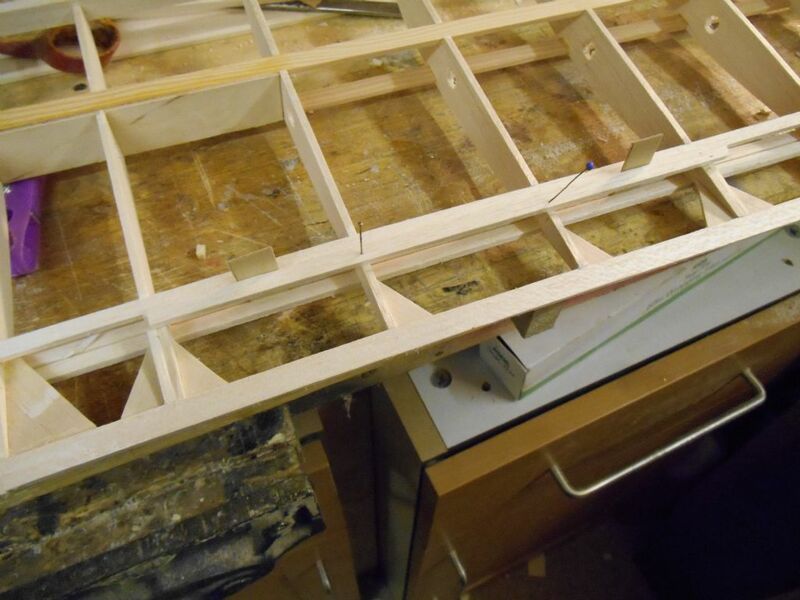 a 1/4" x 1/8" spruce sub frame fitted down 2 edges where the servo plate will glue to the rib and spar and allowed to dry thoroughly. (Not the neatest cutting I have ever done)..
Then glued and clamped into place. This should be more than strong enough for a lightly loaded slow flying.model. Finally for now, the flap servo and outlets for the aileron leads. 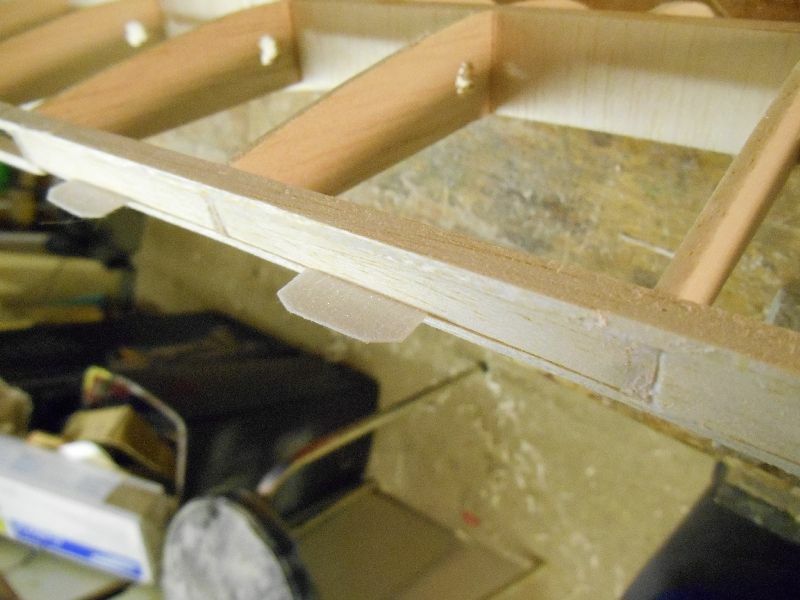 Again - 4mm lite ply is used but no bracing as this is fitted across the 3 centre ribs. Back in the shed again last night. Progress, but things slowed down quite a bit as I am getting into the fiddly bits. First the missing photo of the aileron horn and gusset. The next job is to separate the aileron and flap from the wing. This is done in one piece and then the individual items are separated. 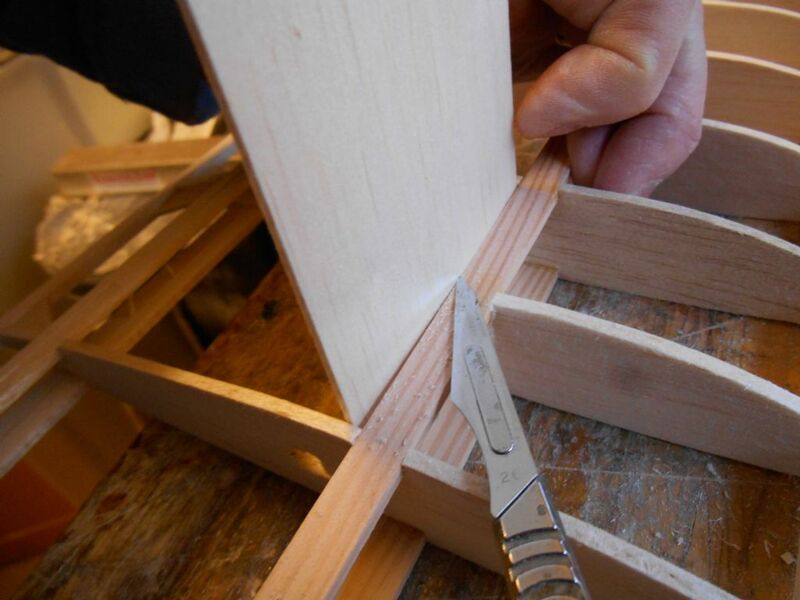 Using a razor saw cut through the ribs behind the wing spars. 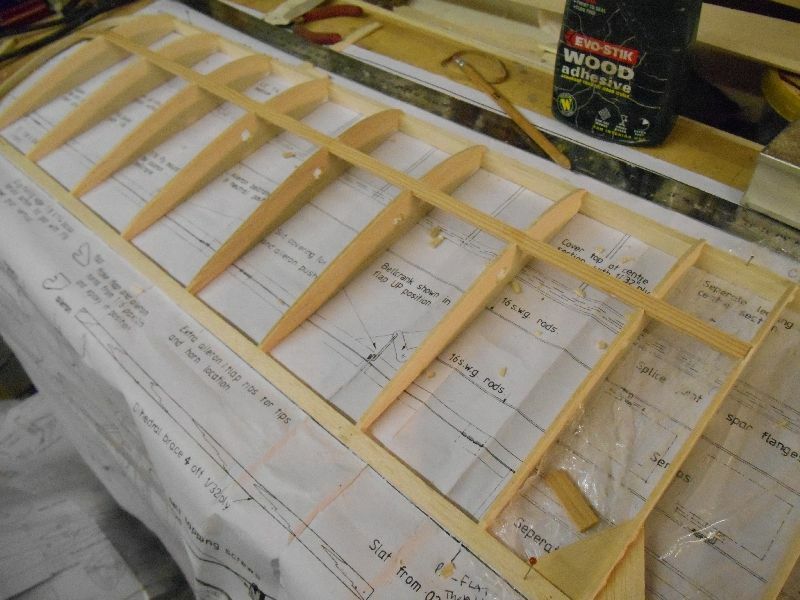 When done - making sure you so stop at the boundaries, cut through the outer double ribs from the TE towards the spar then finally separate the aileron from the flap. 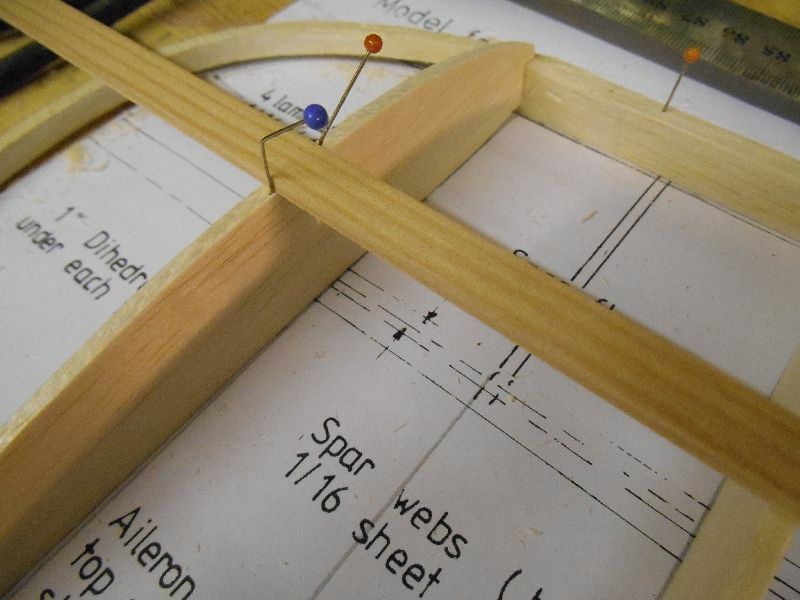 With the ailerons and flaps separated I then filled in the gap between the upper and lower spars on both the wing and the flap and ailerons. 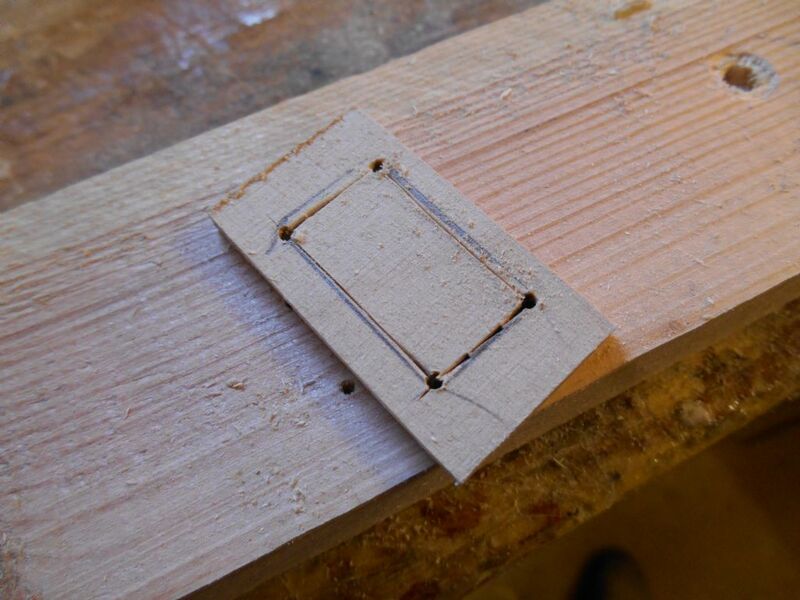 Using 1/8" soft balsa strip cut to size (grain lengthways) and chamfered to fit glue in on 3 edges but the leave the 4th edge where the hinge material will be fitted glue free. These will be glued with cyano when the hinge is installed. Note that the hinge material - I am using hairy Mylar will be fitted sideways to get the most adhesive to wood contact area. Note that the ailerons are hinged on the upper boundary, the flaps hinged on the lower boundary. 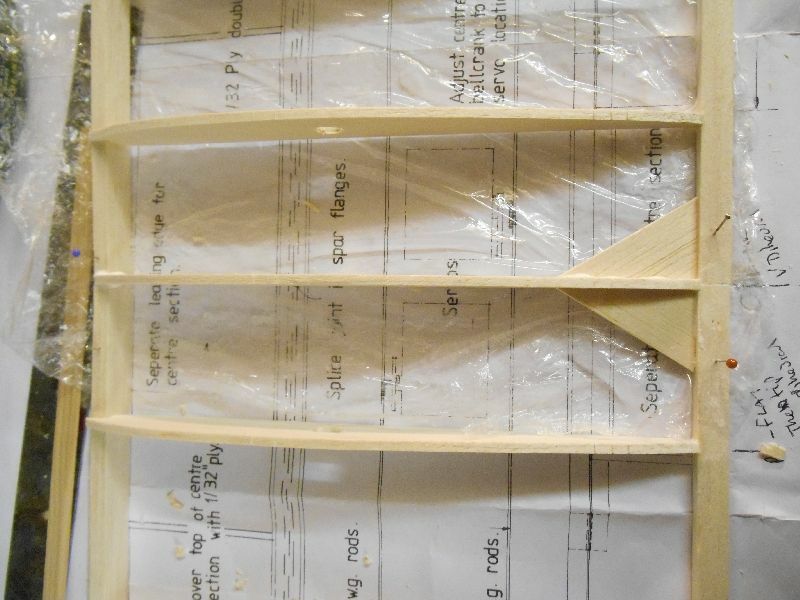 I have also added a short spruce sub spar in the centre to support the elastic bands that will be used to retain the wing. After a certain amount of thought, I have elected to use torque rods for the flaps. As I have chosen to use a V dihedral wing, these are now simpler to fit than the bellcrank pushrod method suggested on the plan by PR. So cutting the tube and bending the 18swg piano wire. Brass tube is easily cut by rolling the tube under a Stanley knife blade and then it will snap off cleanly when it has been scored all around the circumference. Make left and right handed torque rode with the (short) push rod arms bent backwards at about 45 degrees. The long legs will fit into the flap. 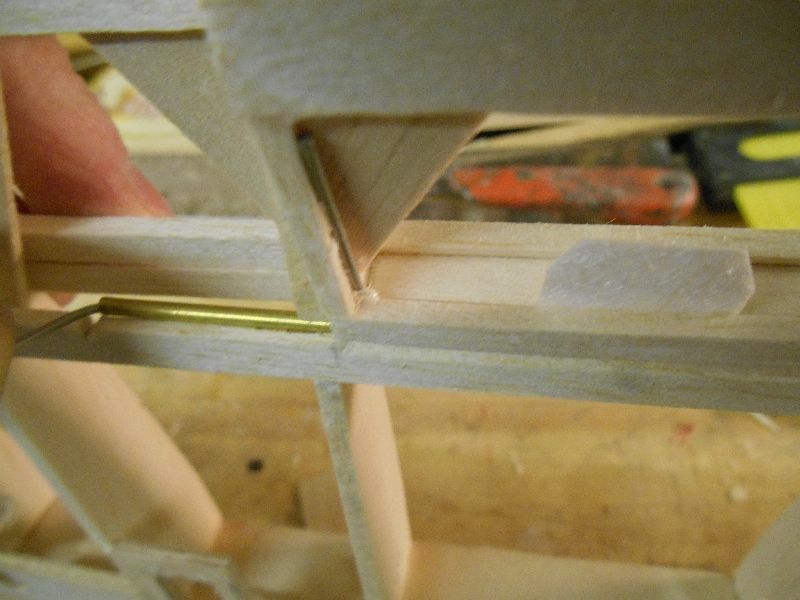 The hinge line of the torque rod must line up with the hinge line of the flap so drill a suitable hole and relieve a little wood (from the flap and the lower wing spar) so that the hinge lines up. Temporarily refit the hinges and use the 1/32" ply spacers to set the flap/wing gap and check that it moves OK when the arm is moved. 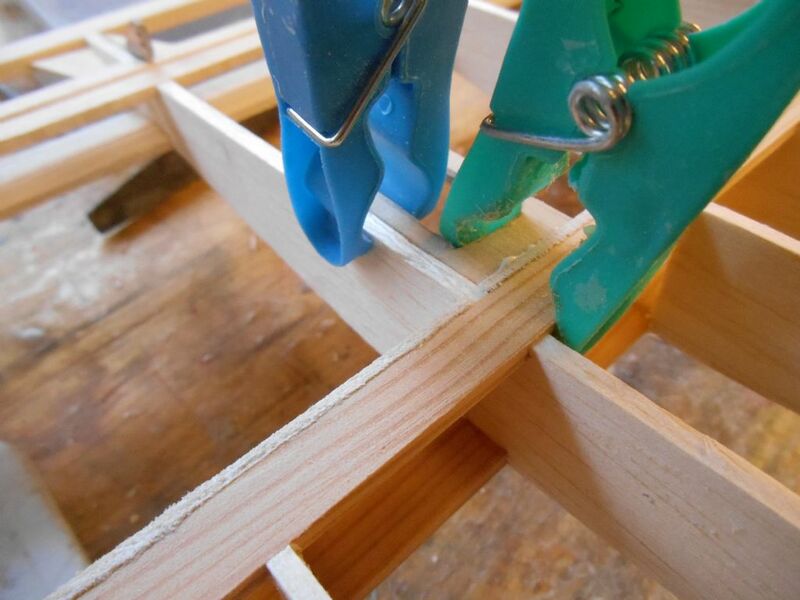 When happy, clamp and glue into place. These are the little camping pegs that mentioned in an earlier post. 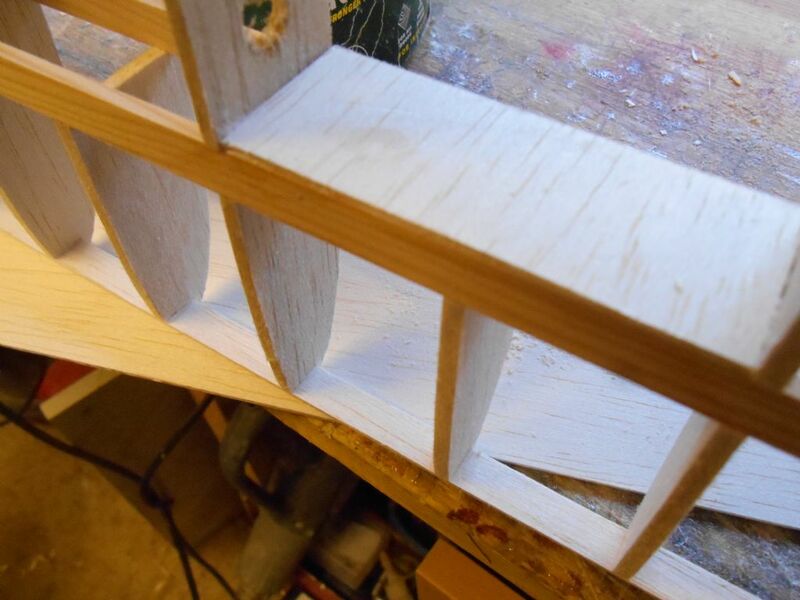 Next job is to finish off the wing detail and then start on the tailplane and fin. I think I will bookmark this thread, very informative for a newbie like myself. Spot on chap. I thought you said you slowed down when you get to the tricky bits! Very informative and interesting thread Martyn. Great thread Martyn, nice to see it so photo documented, we can see what you are explaining, and then say hmmmm I get it now, well done! Only had an hour in the shed last night so not too much done. A bit rough but un-sanded. I have been thinking about the bearing surface between the lower part of the wing and the fuselage. I don't want to nor do I think it is necessary to fully sheer the centre bay - we never used to when I was flying free flight. However, we do need some sheet around the flap horns and a little along the load bearing ribs where the fit against the fuselage, Big gussets! I may revise this further. 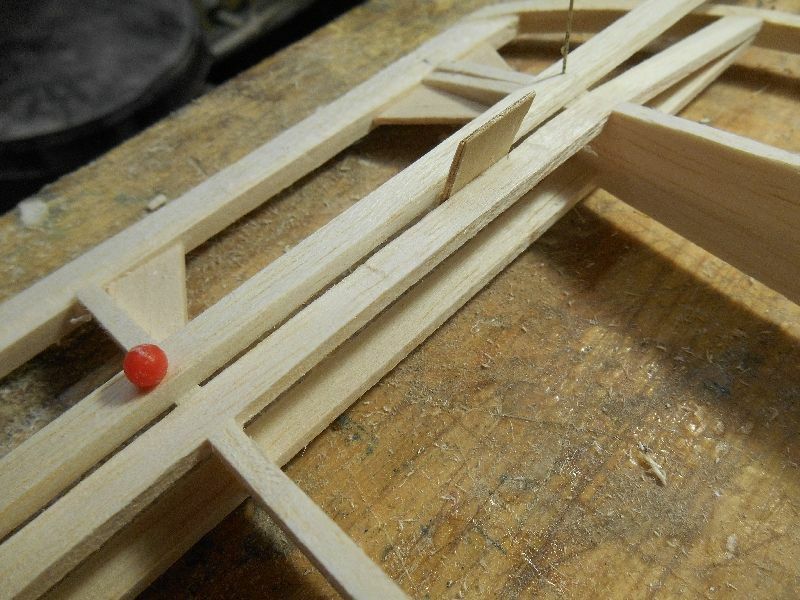 I have already beefed up the centre bay behind the LE with 1/2" x 1/4" balsa. You can see that in the photo of the short spruce doubler above. Just forgot to mention it at the time.. 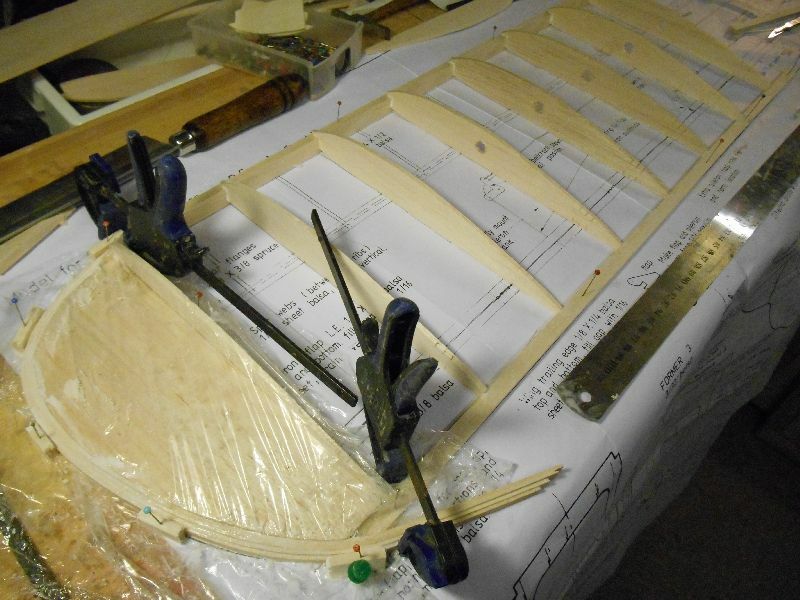 So put the wing aside for a while and make a start on the fin and rudder. 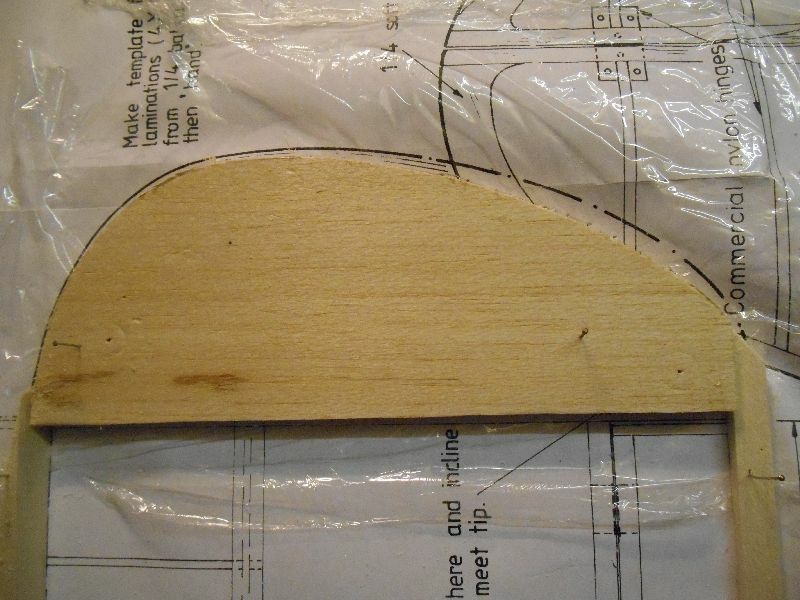 You need the fin to make the tailplane as you will see so I am making the fin and rudder first. 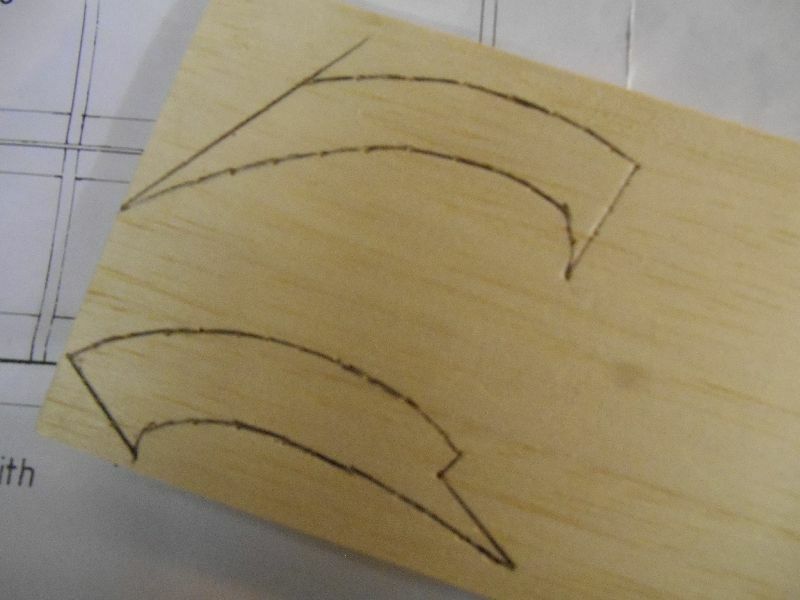 Using the pin prick technique, mark out the curved bits onto a piece if soft 1/4" sheet. Pay attention to the grain direction - it really matters. The grain is usually along the longest edge. Use a rule to link the straight edge dots..
Cut them out carefully. 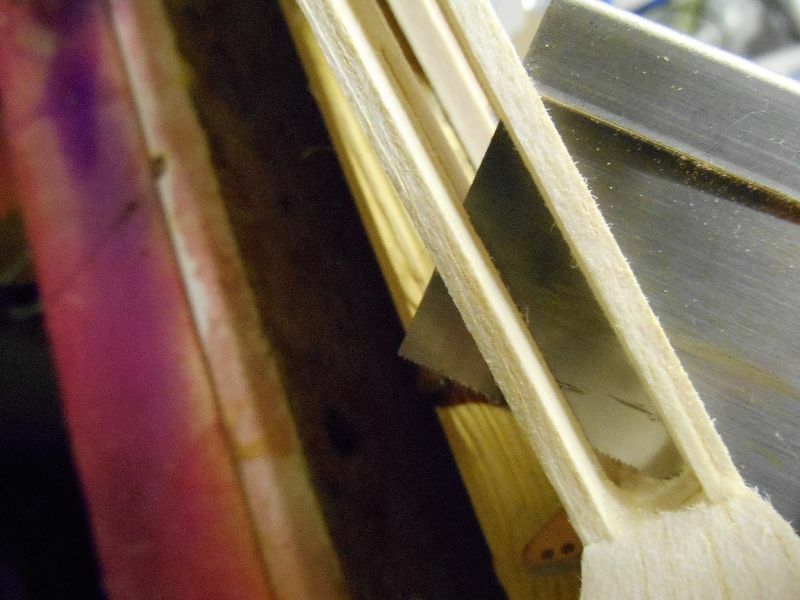 If you have a bandsaw - great, if not then use a fret saw or similar. I have never really succeeded using a scalpel for intricate cuts in thick sheet like this, I usually end up breaking bits off and having to redo them. As usual, cut to waste than sand back to size/fit. It may take several cuts to get around the sharp curves - don't stress the wood by trying to do it in one go..
Of course they will fit - eventually.. Protect the plan with cling film.. I am more concerned with protecting the structure than the plan though. 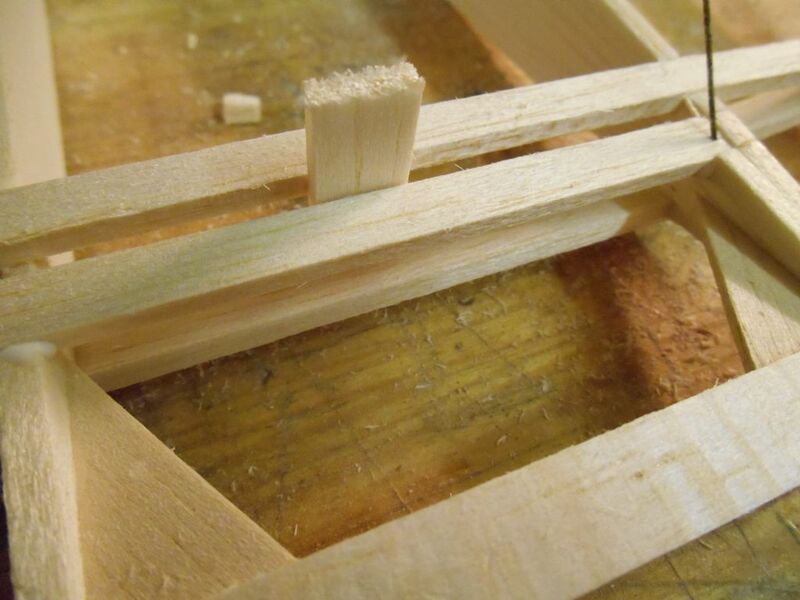 On thick structures with big joints glue will invariably seep through and you will end up with bits of plan stuck to your wood. This can be a real pain to remove..
Another minor deviation from the plan. 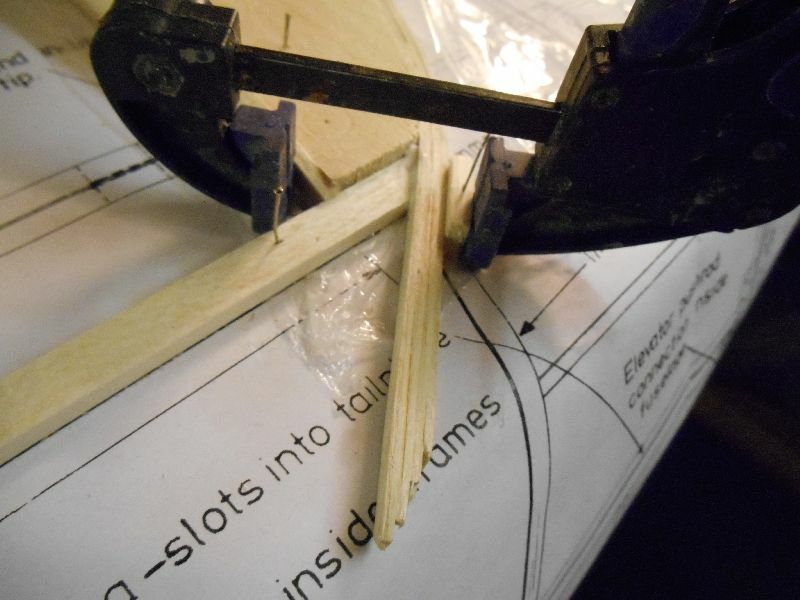 PR has indicated that the rudder TE should be 1/4" x 1/8". As the ribs are 14" thick this would mean packing up the TE by 1/16" to centre the TE section. I have chosen to use 1/4" square and I'll sand it down afterwards. It's a bit more effort but seems to be more sturdy and easier to build and keep flat this way.